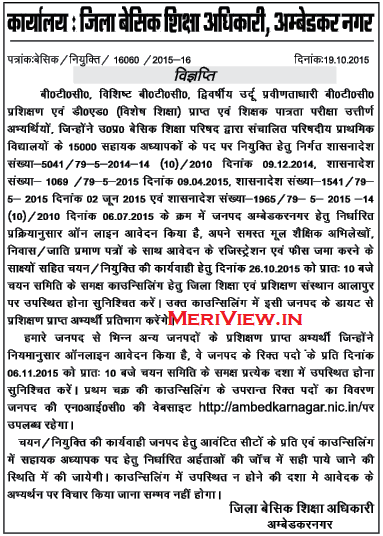 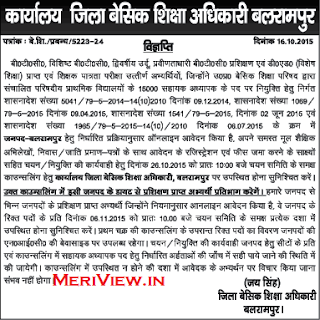 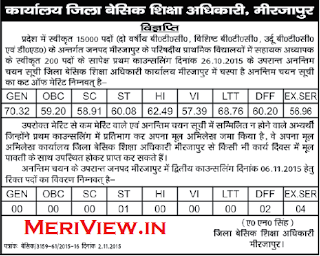 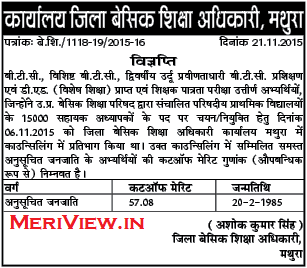 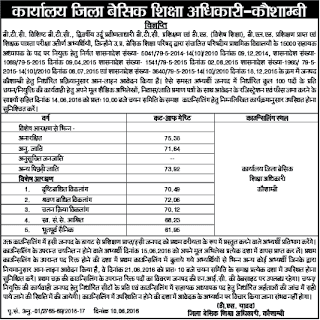 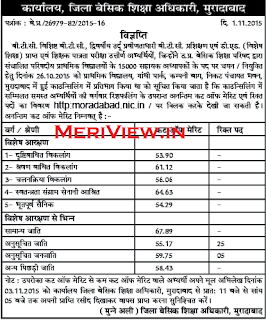 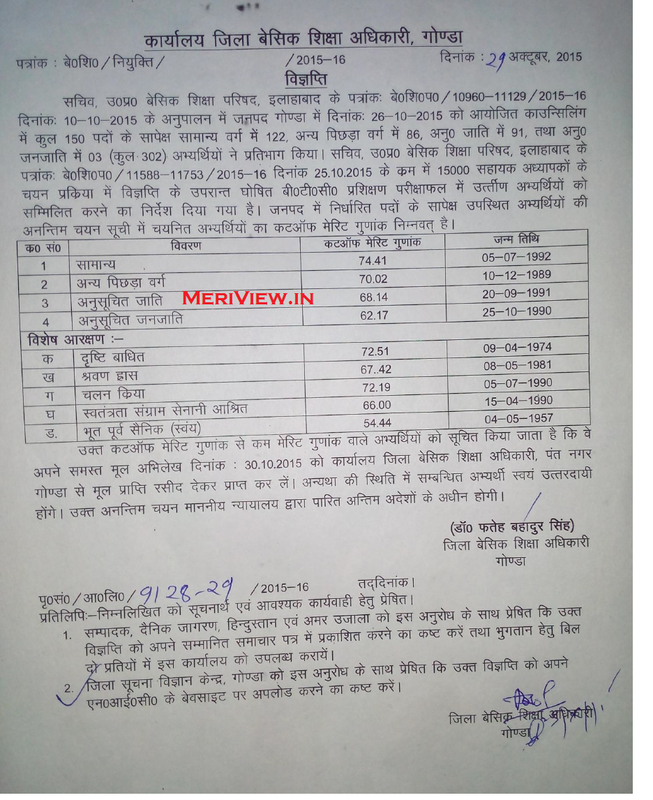 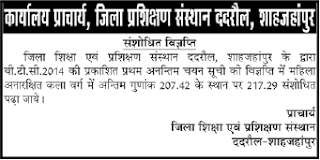 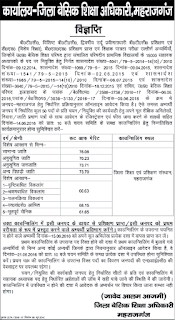 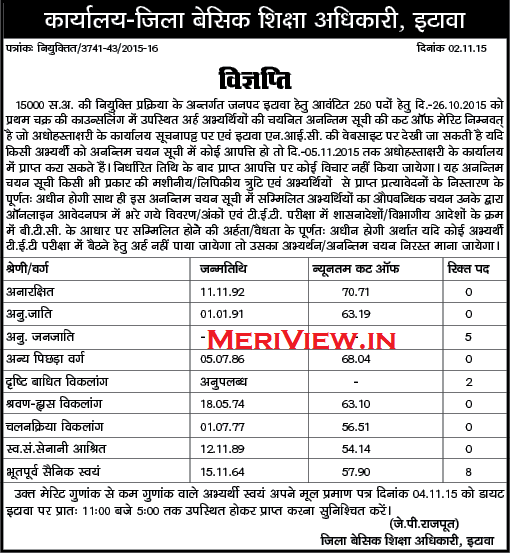 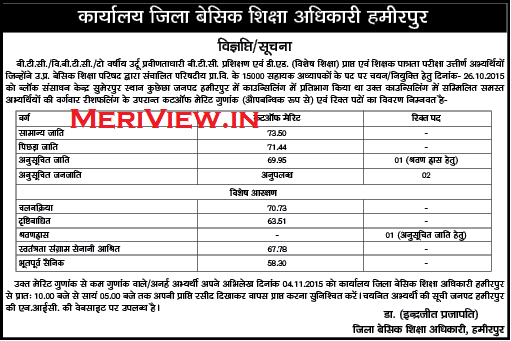 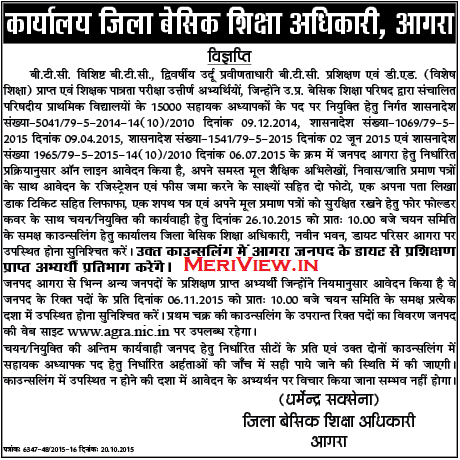 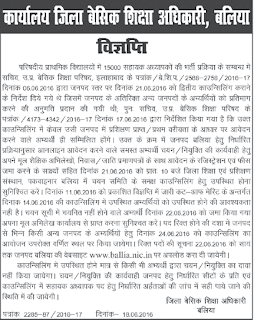 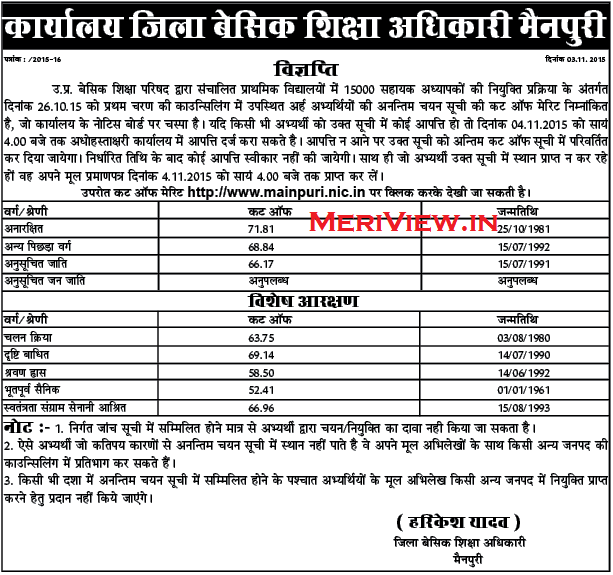 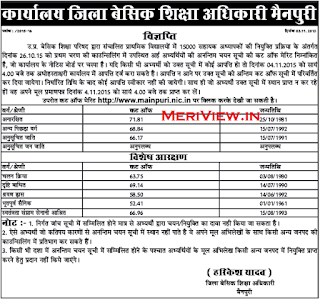 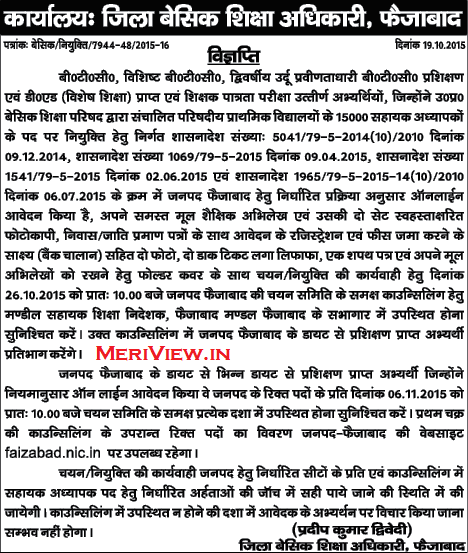 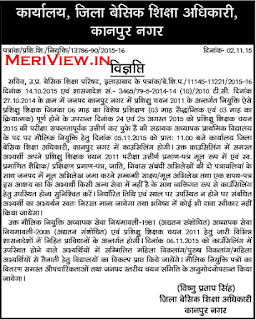 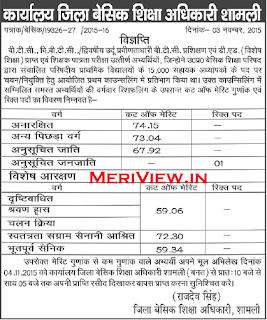 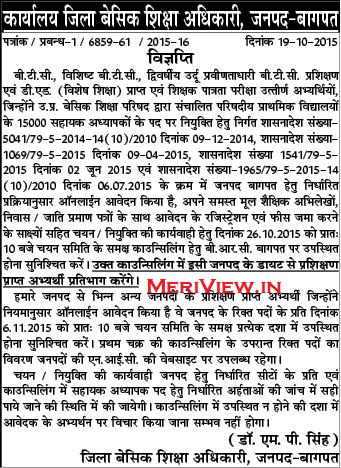 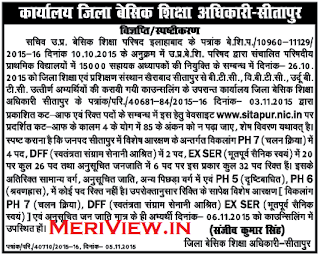 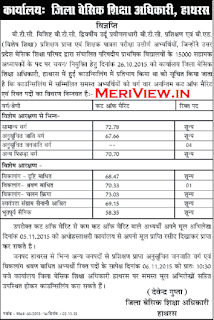 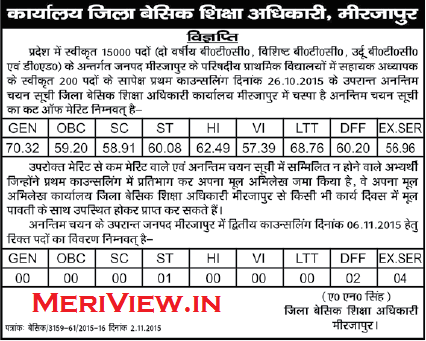 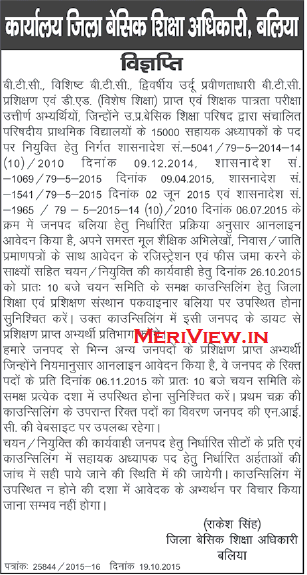 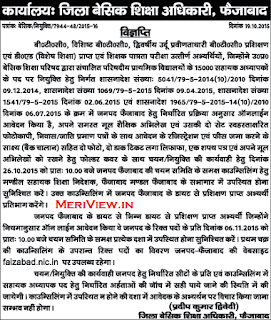 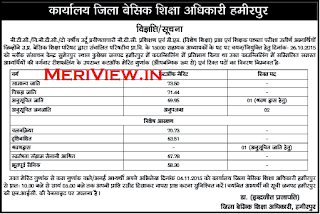 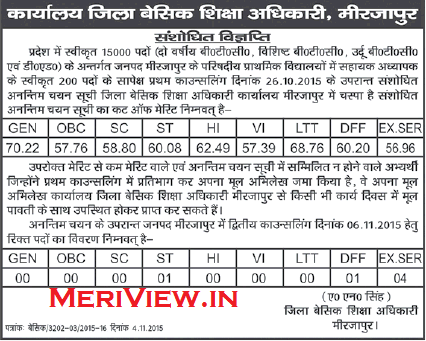 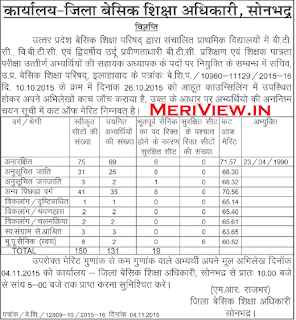 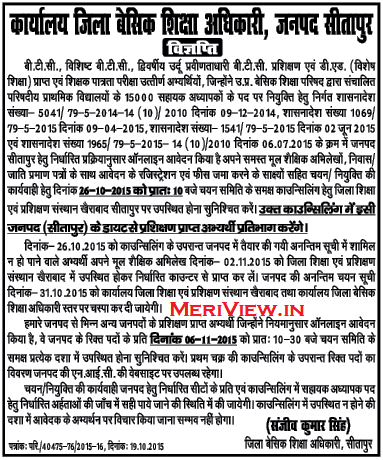 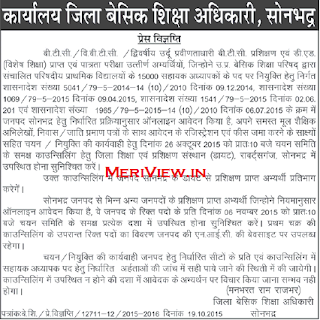 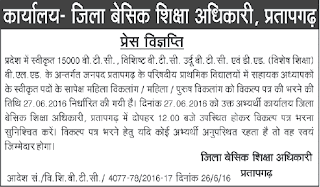 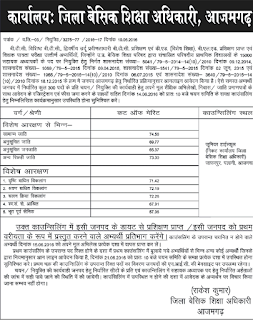 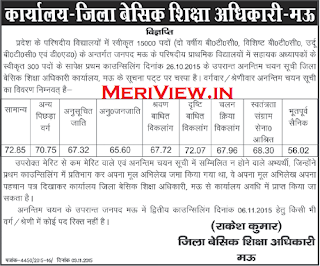 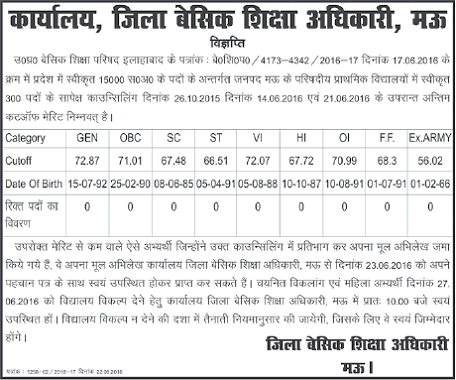 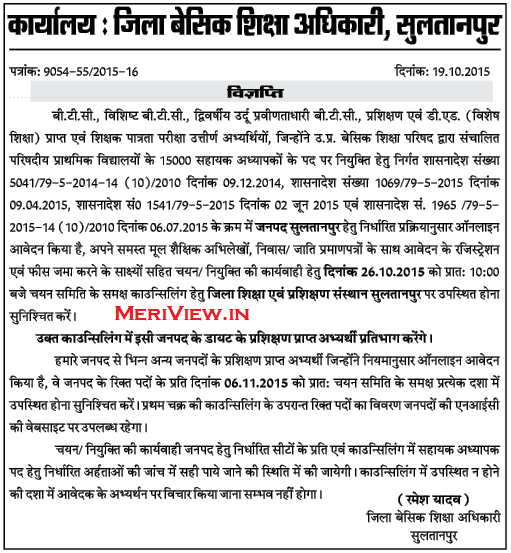 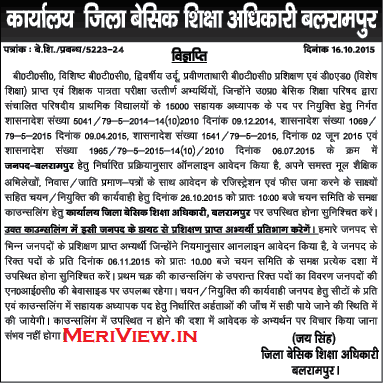 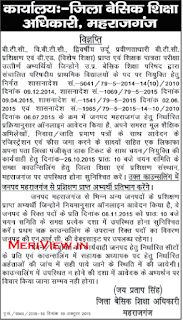 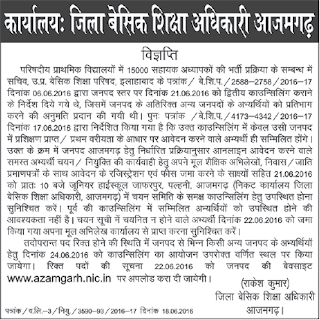 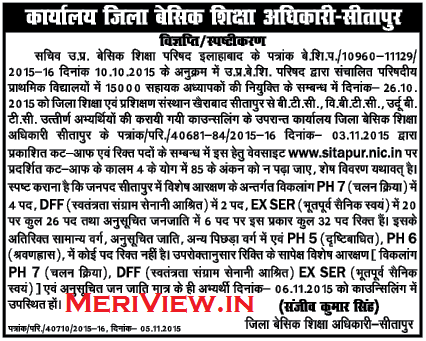 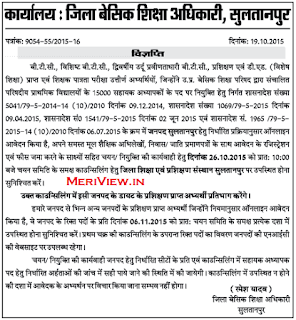 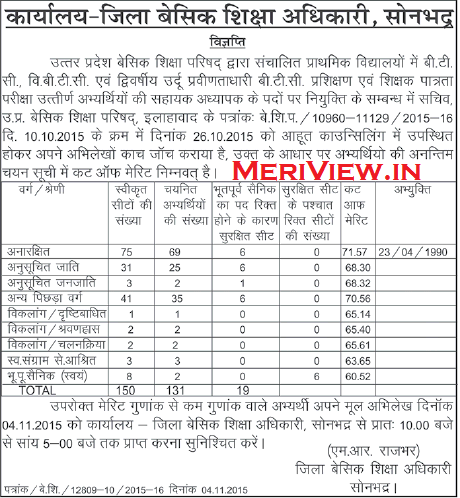 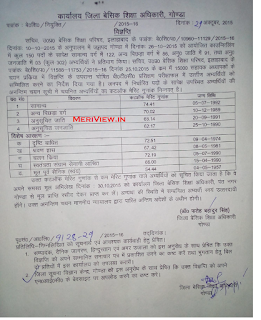 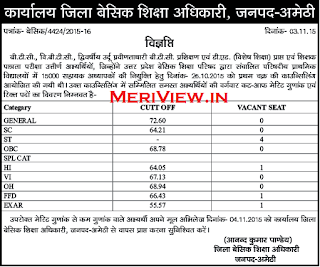 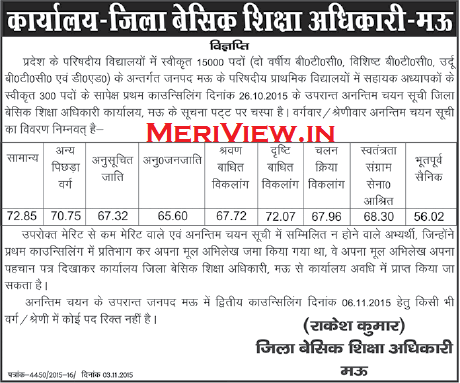 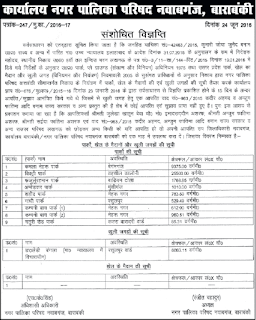 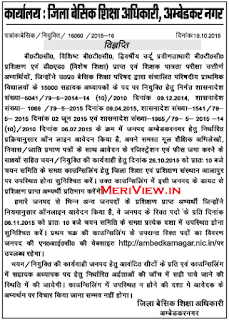 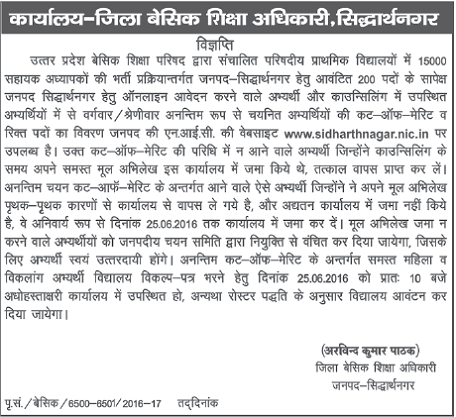 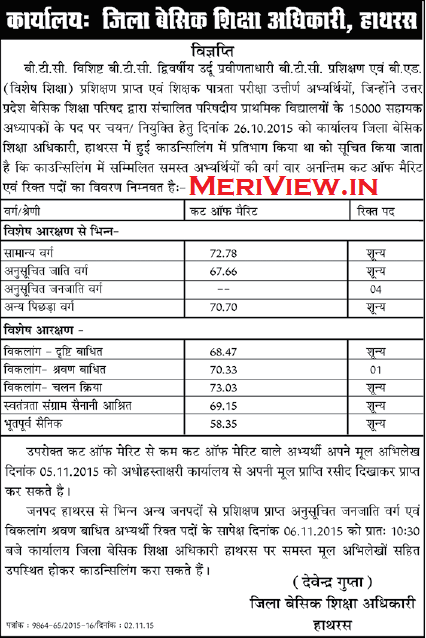 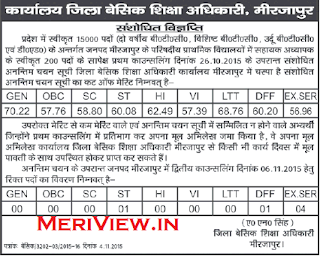 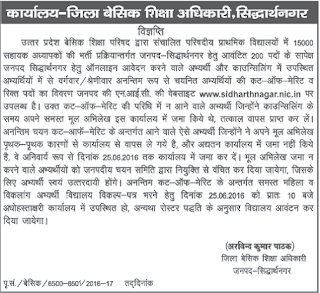 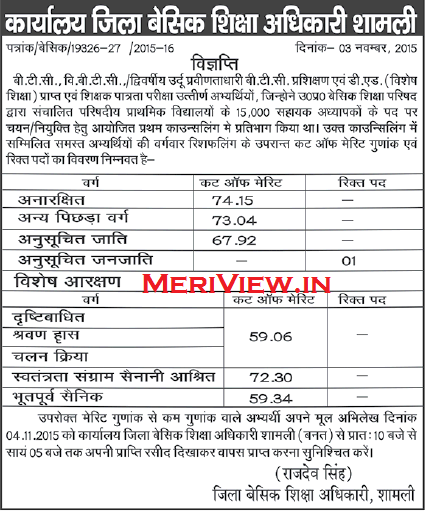 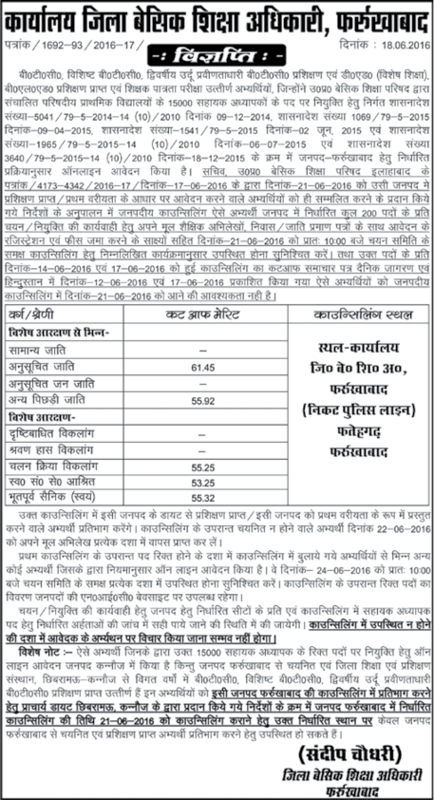 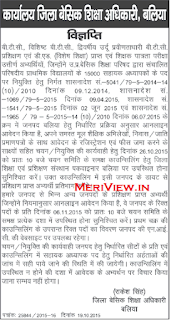 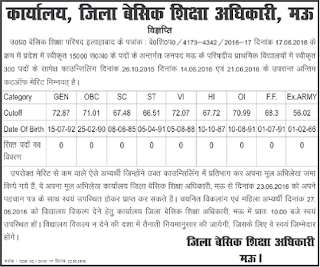 BTC 15000 Teacher Vacancy Latest News - Check UP 15000 Assistant Teacher Bharti Counselling date / schedule, Appointment letter: Uttar pradesh basic shiksha parishad is going to conduct counselling for 15000 Asst. Teacher bharti. 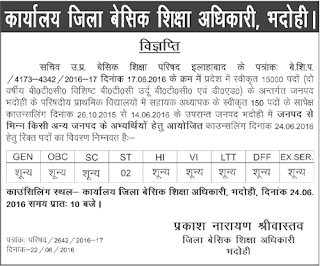 To be eligible for assistant primary teachers in UP, Qualifying TET is the requirement along with being BTC/ VBTC qualified. 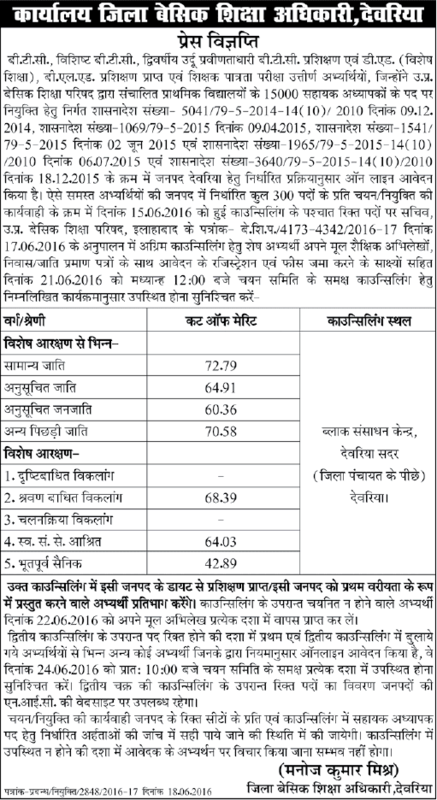 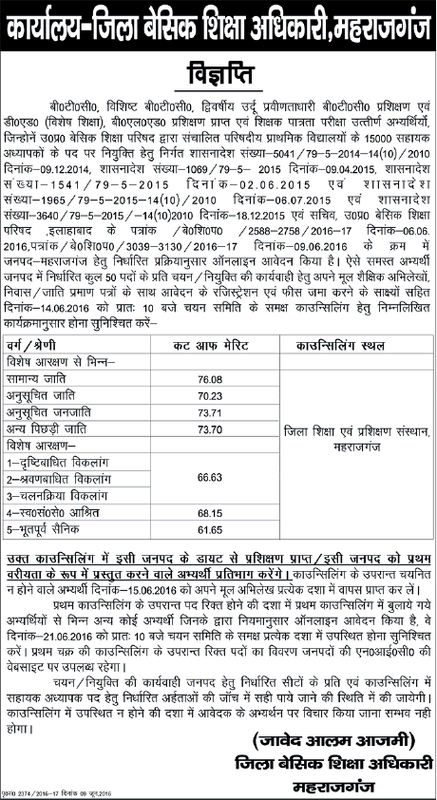 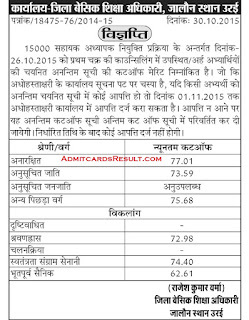 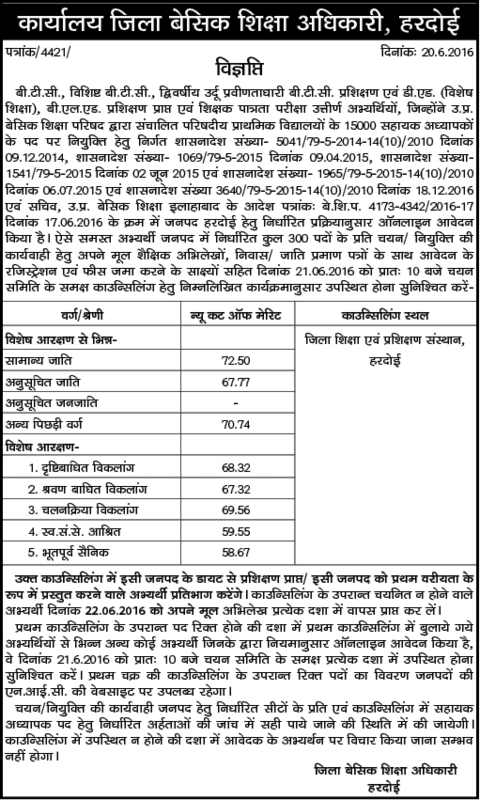 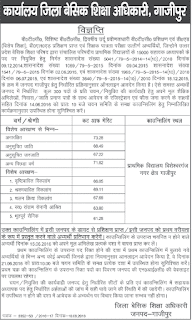 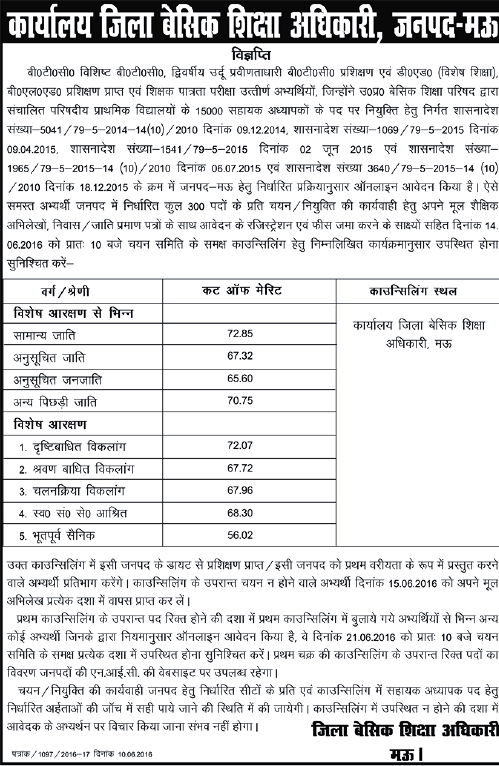 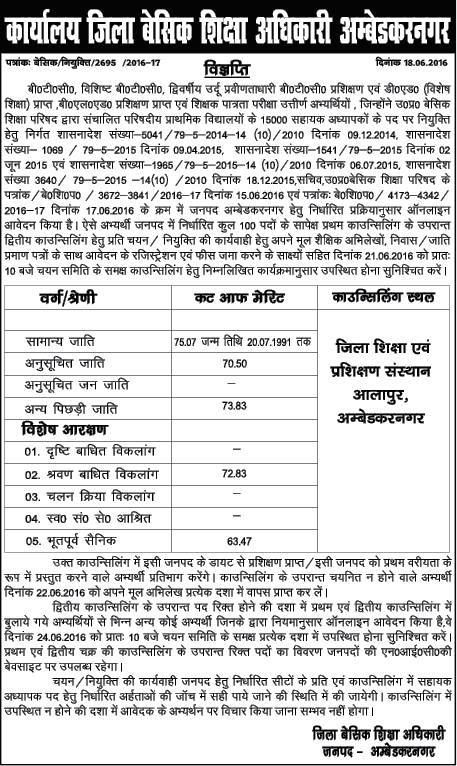 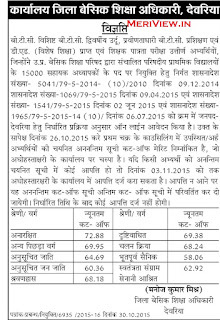 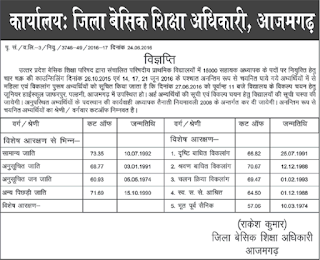 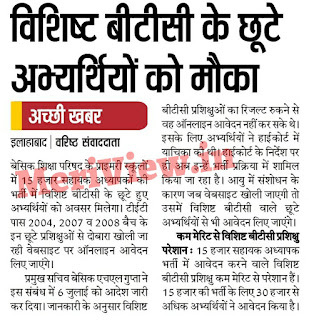 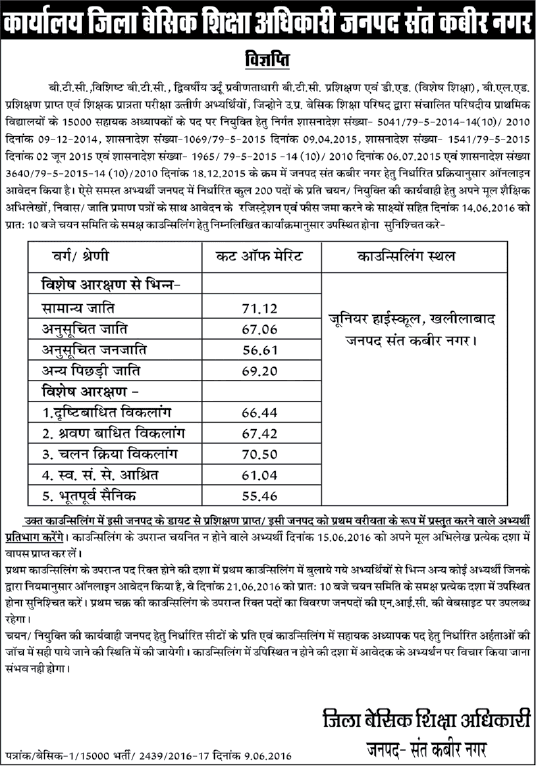 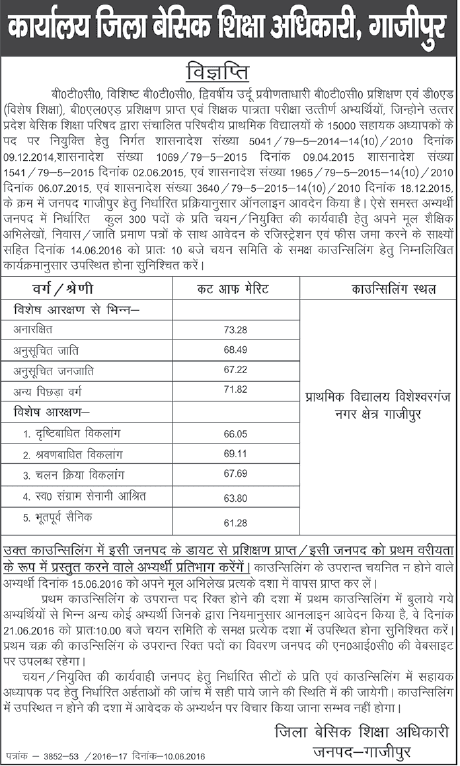 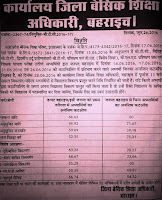 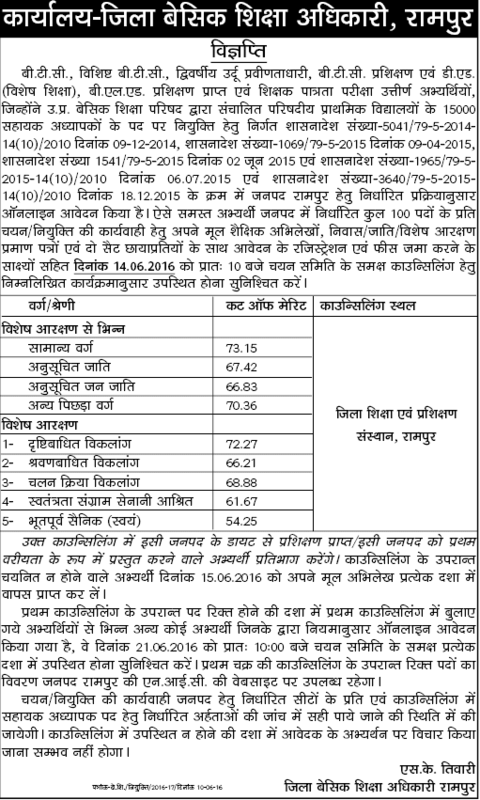 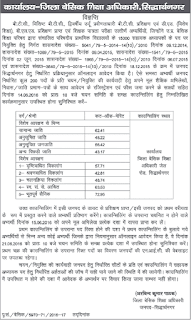 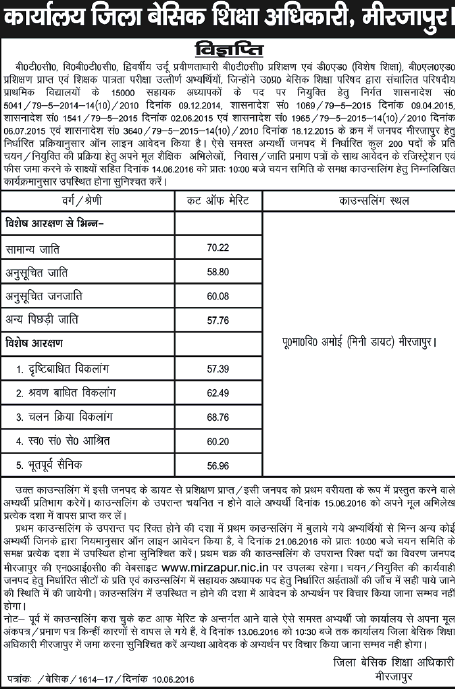 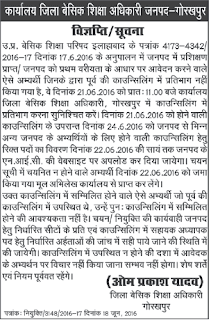 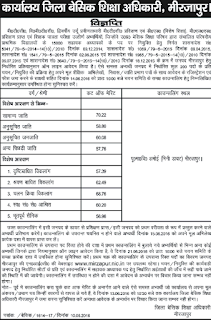 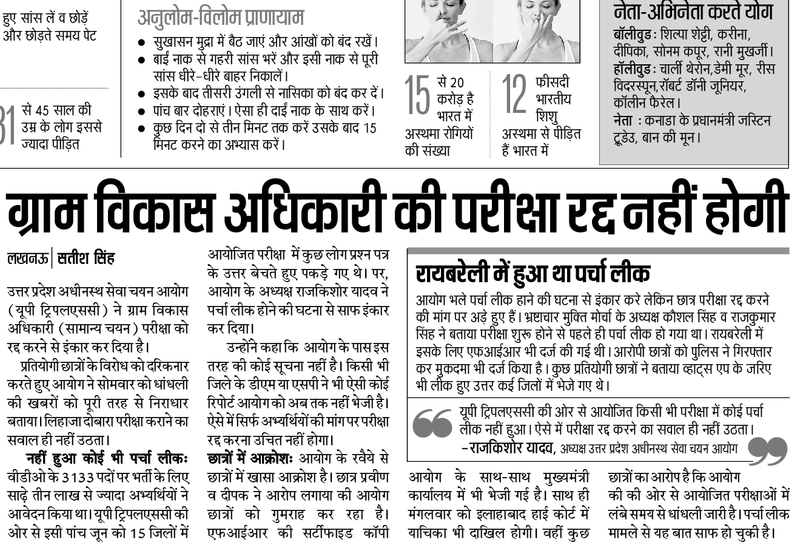 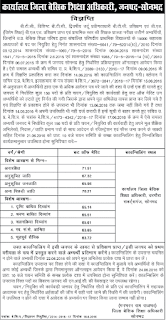 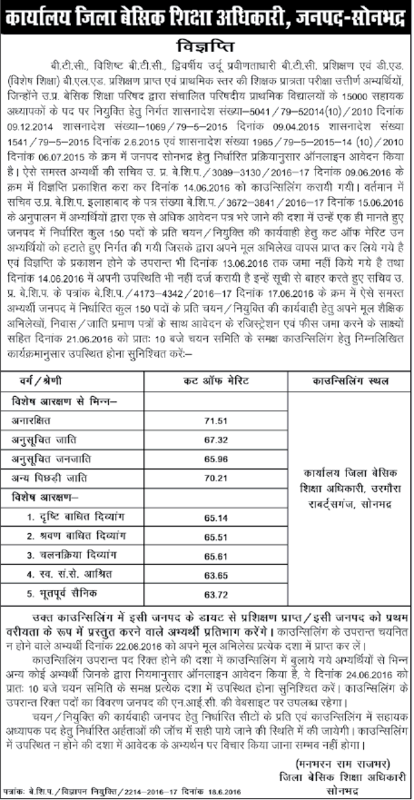 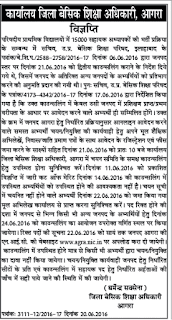 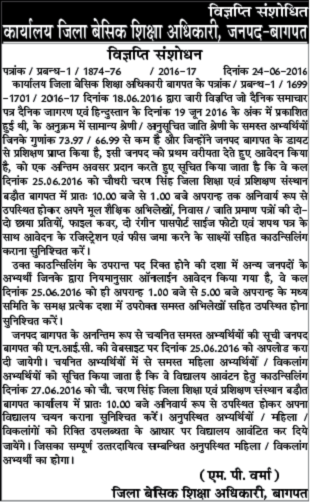 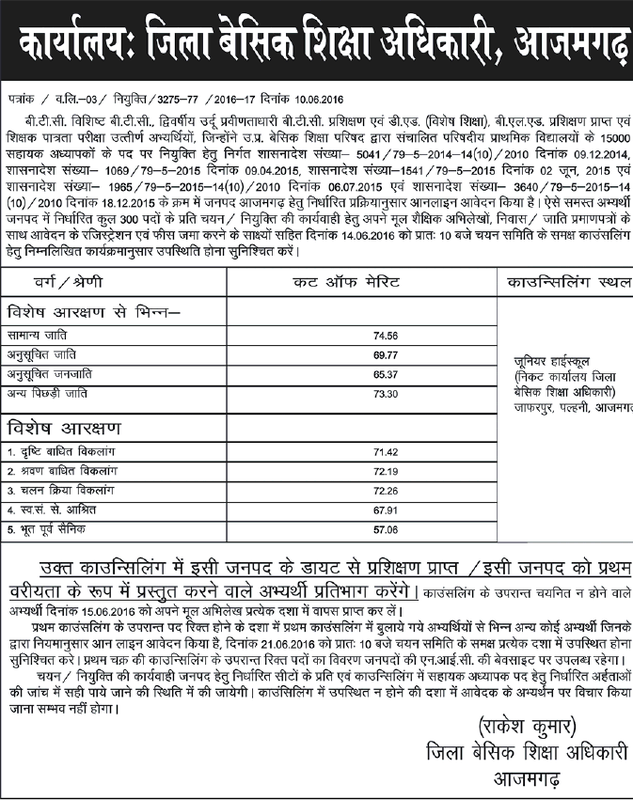 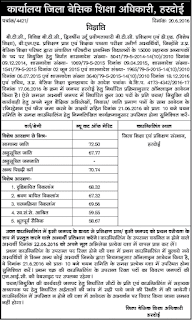 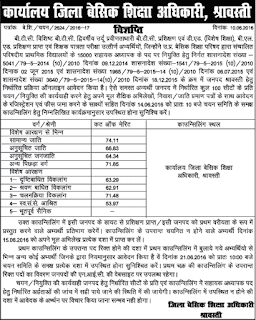 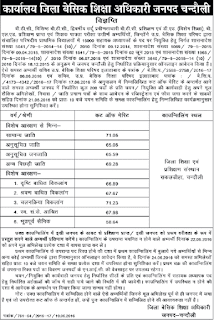 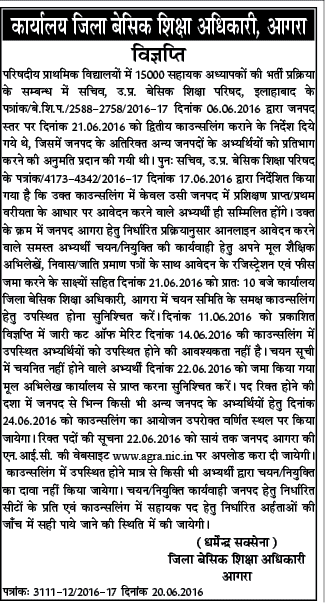 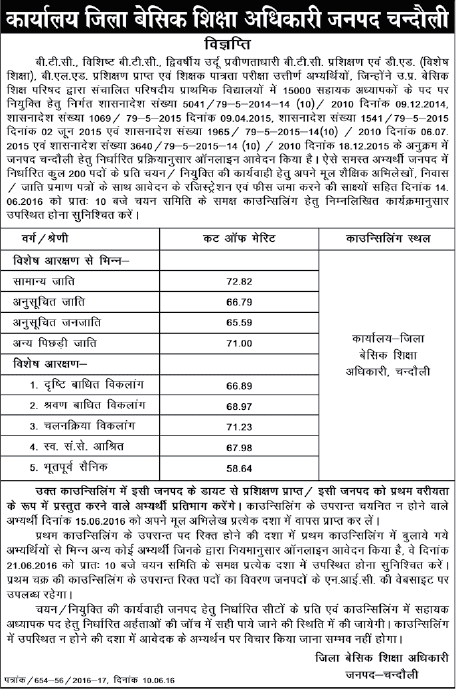 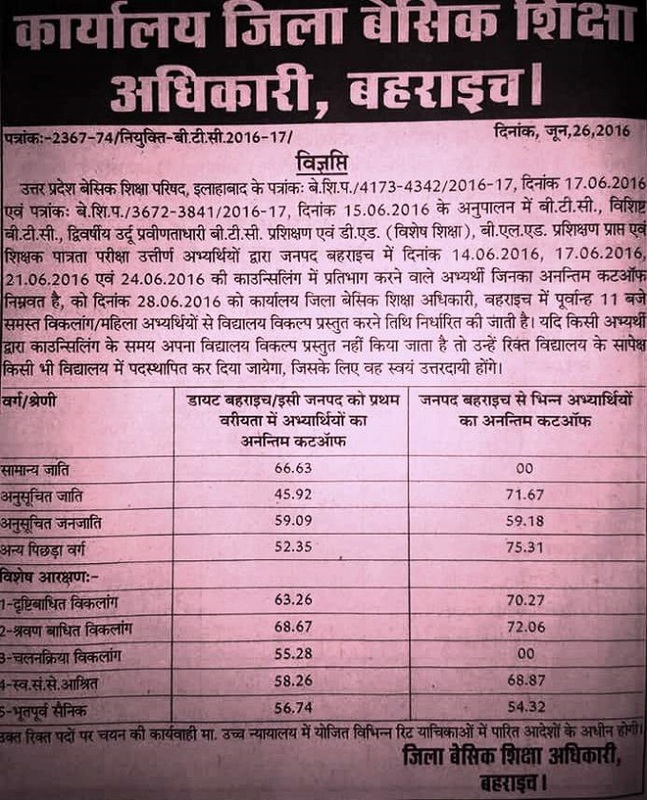 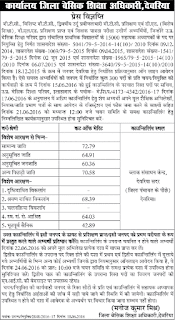 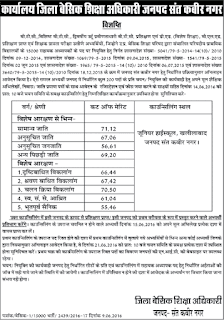 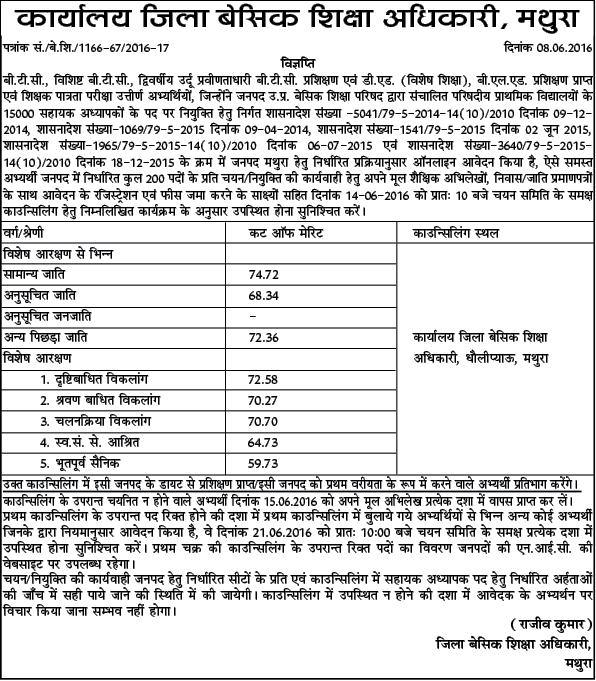 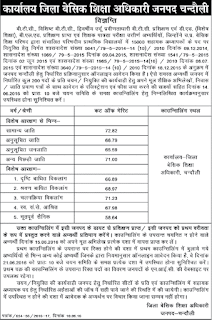 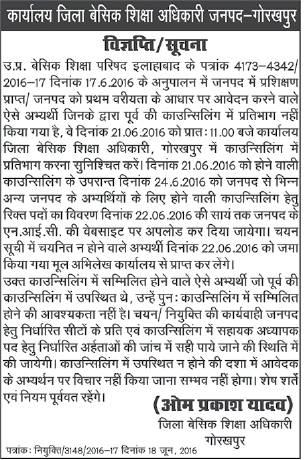 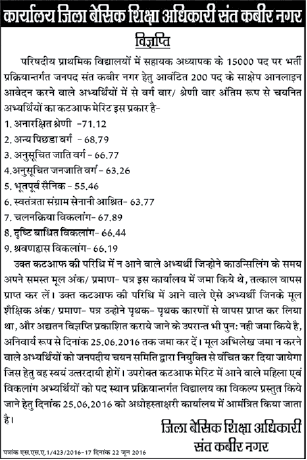 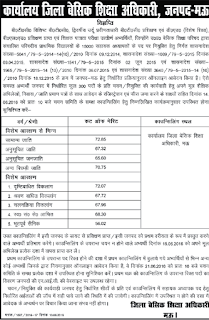 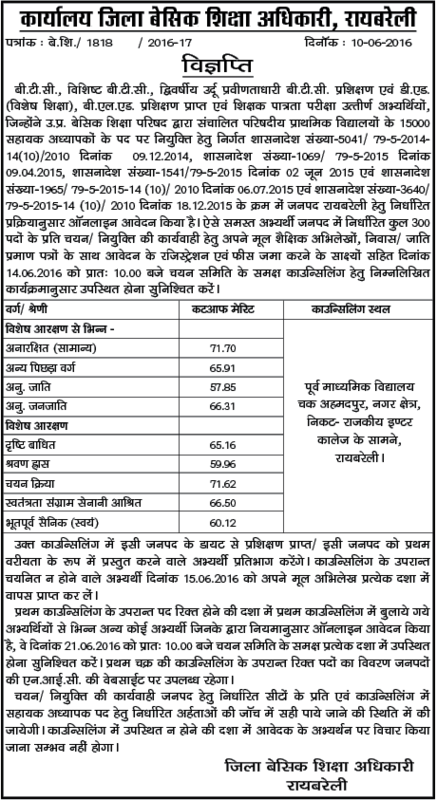 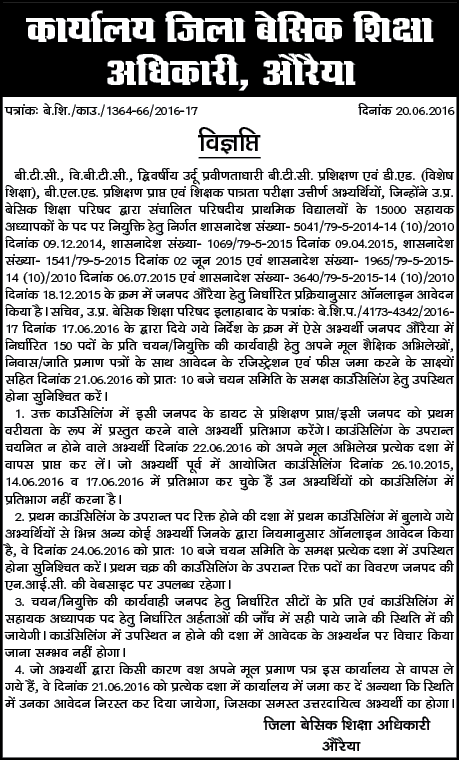 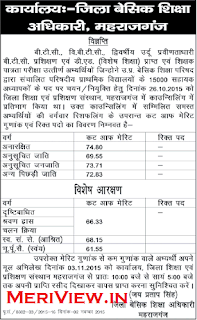 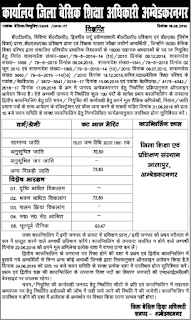 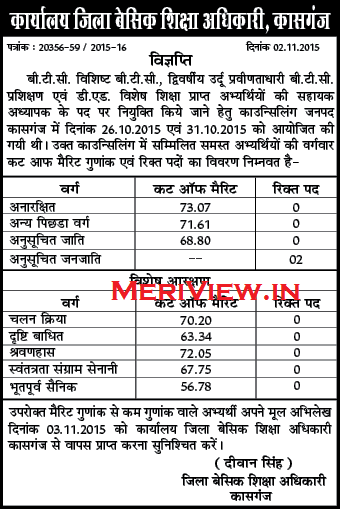 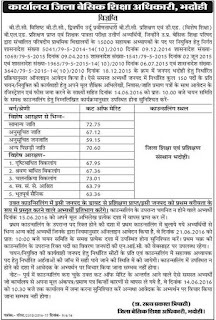 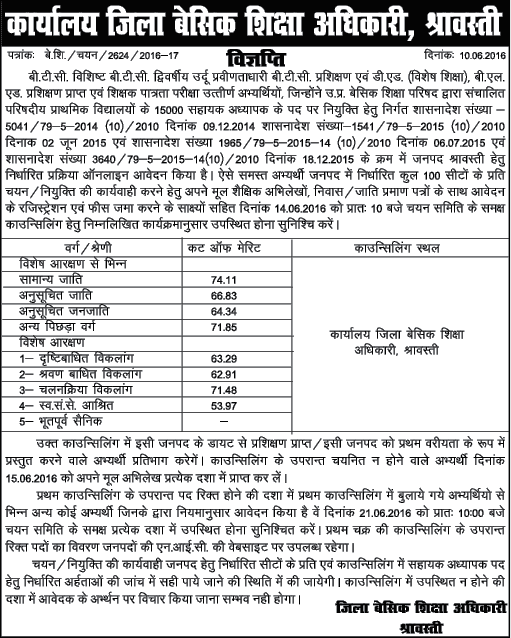 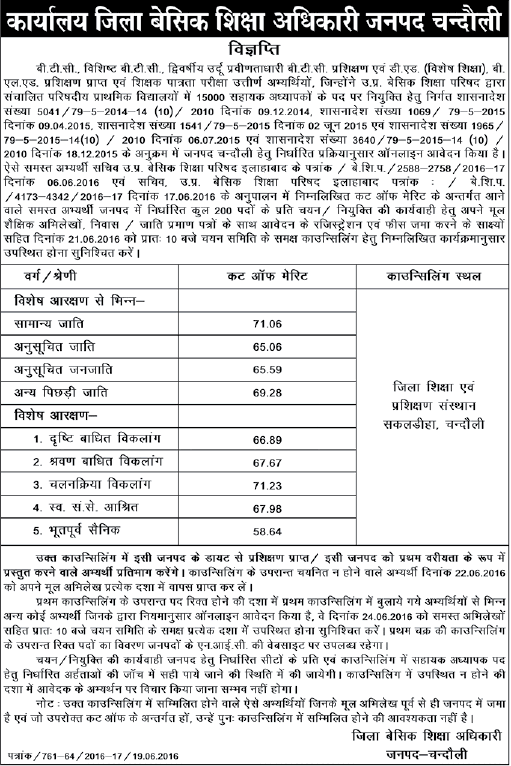 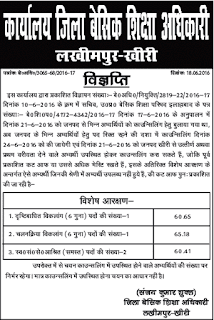 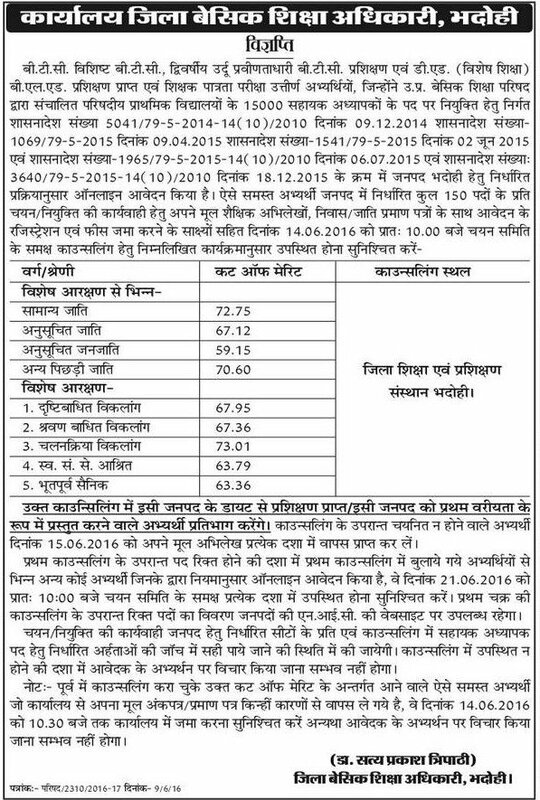 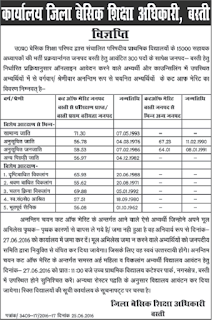 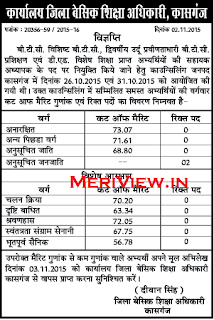 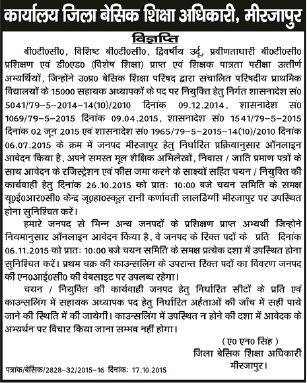 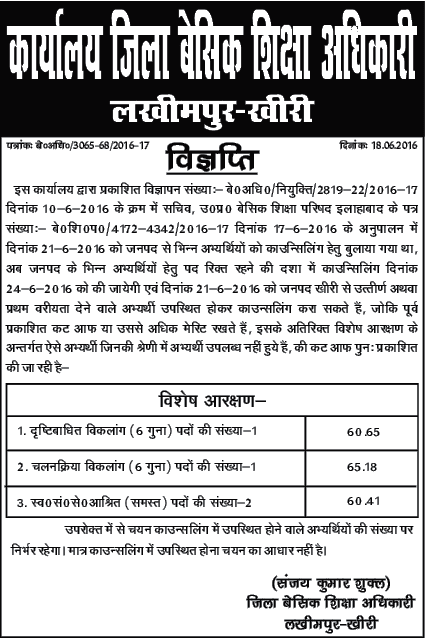 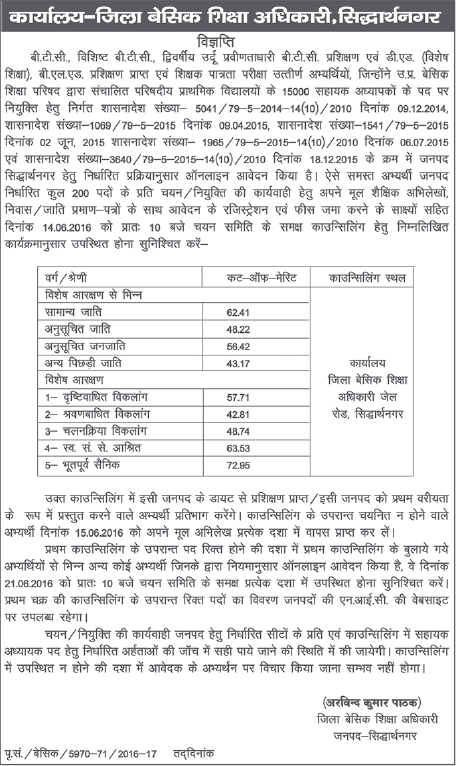 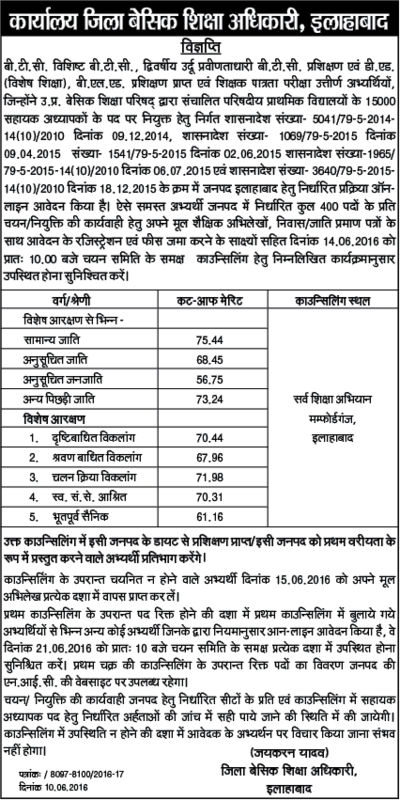 UP Basic Edu Board had released the G.O. 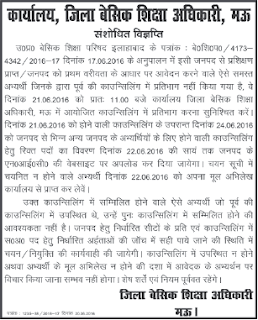 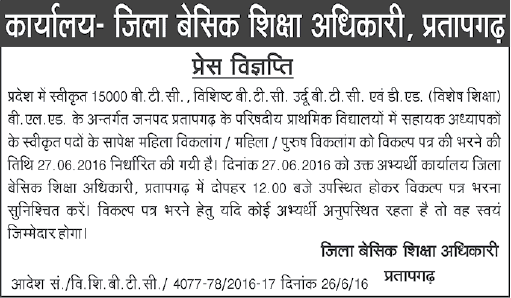 for Counselling to be held on 14, 21 & 24 June 2016. Also Joining letters are to be given on 28 June 2016. 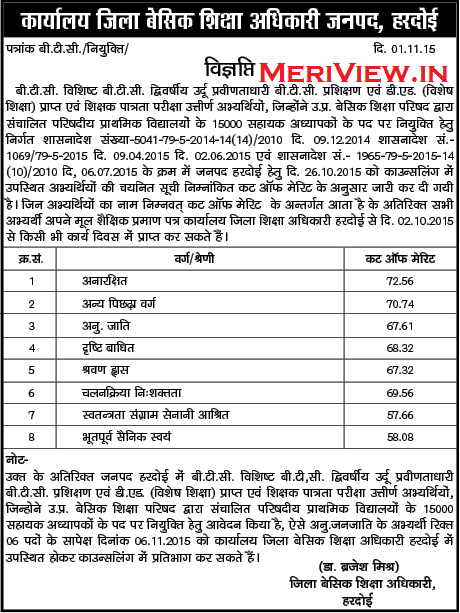 Cut off merit had been released for various districts. 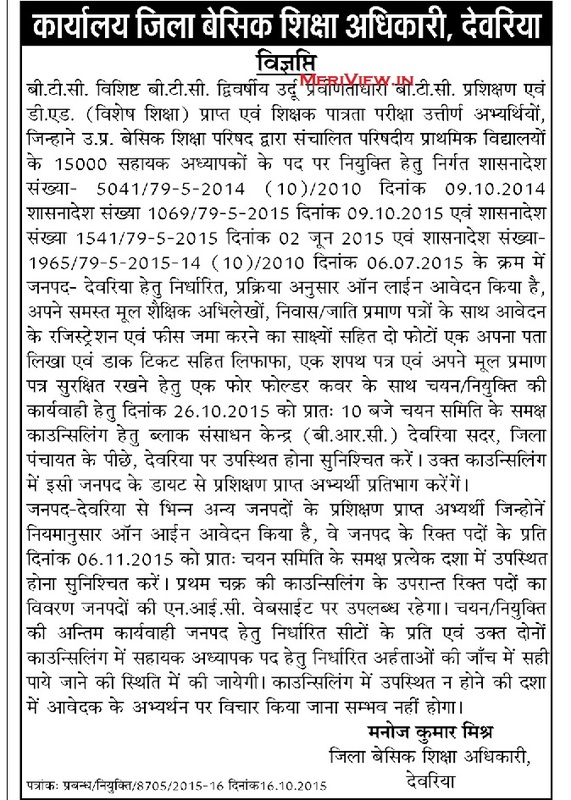 Candidates can check BTC 15000 Teacher Result Counselling updates from below. 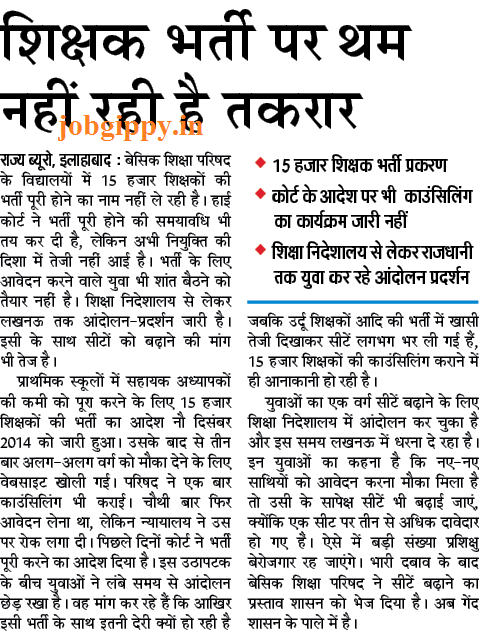 Candidate's selection is to be done on the basis of Counselling which will be held district-wise. 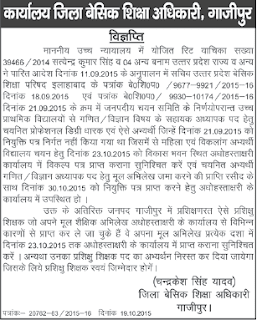 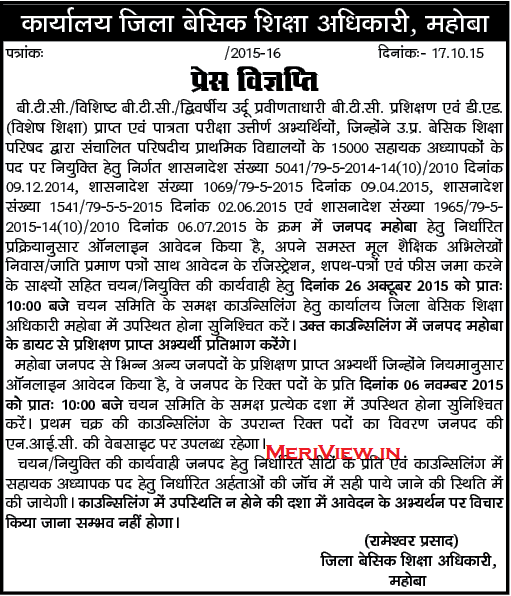 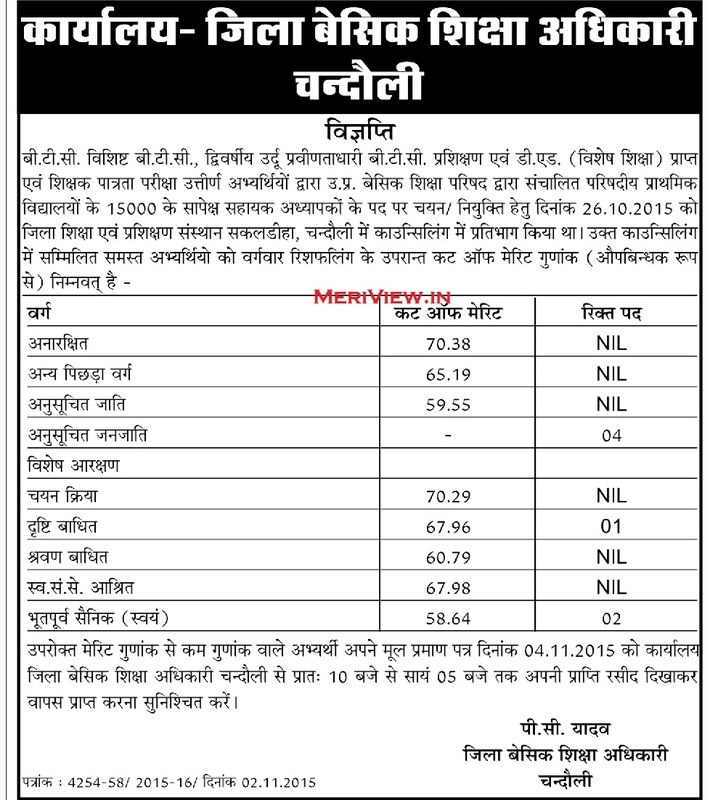 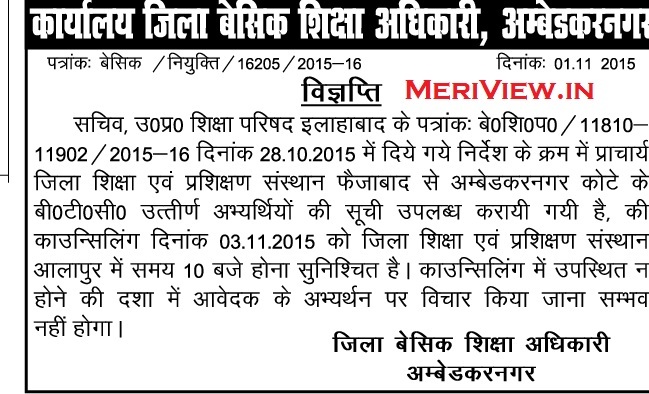 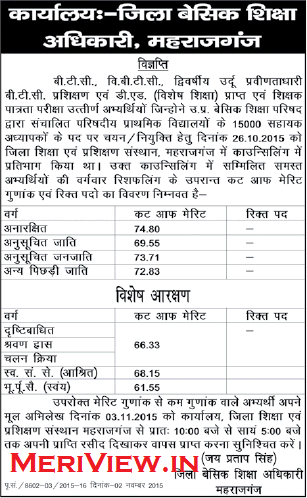 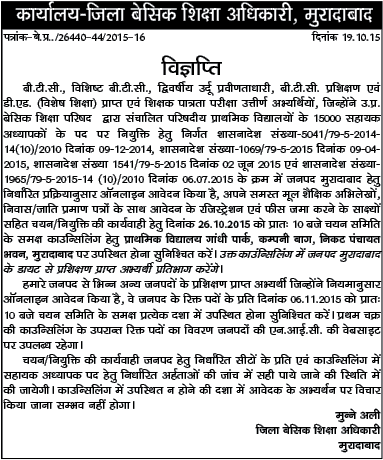 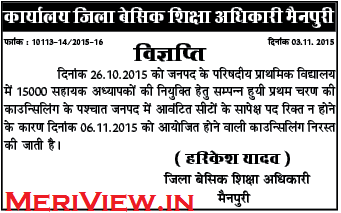 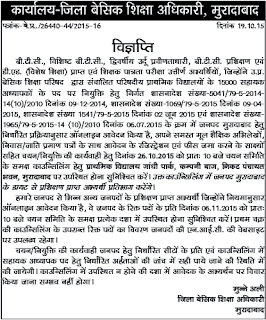 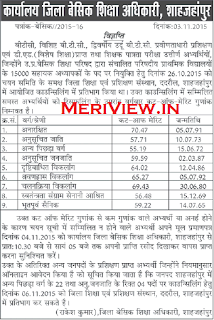 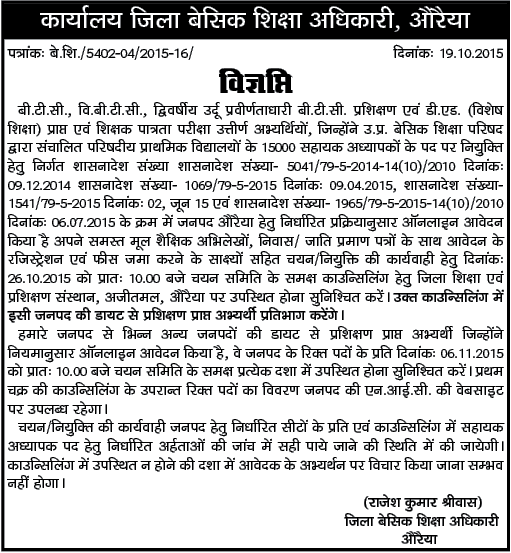 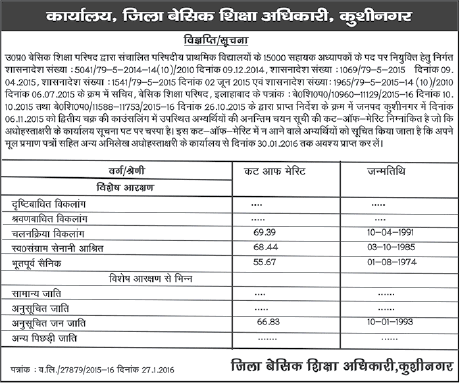 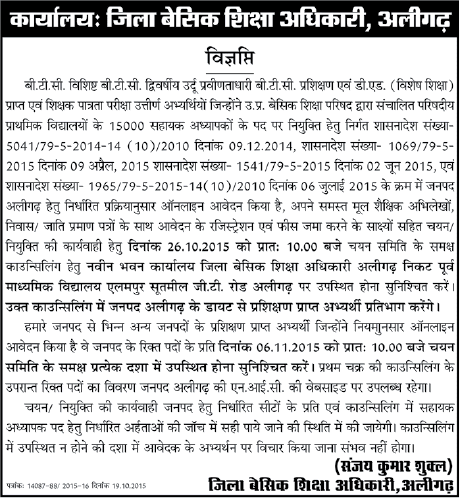 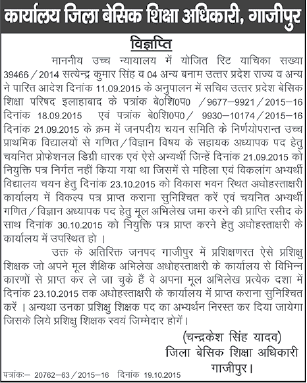 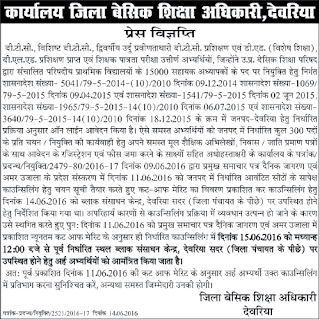 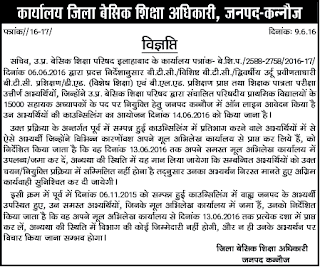 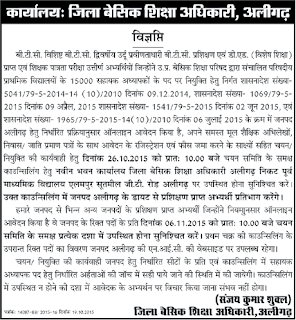 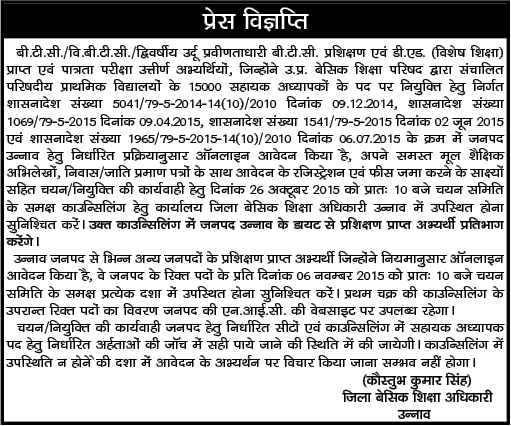 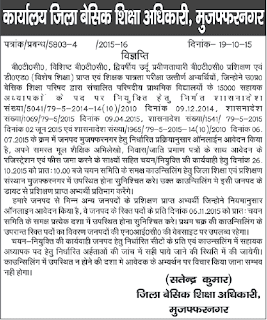 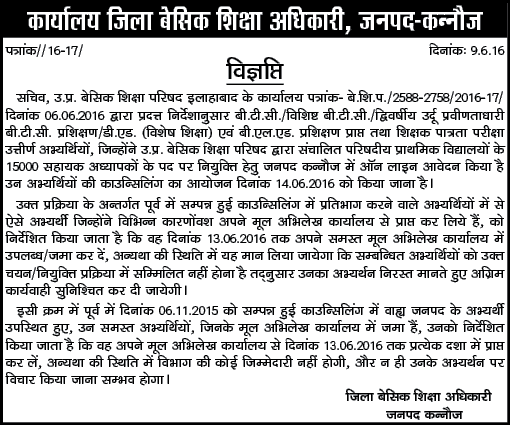 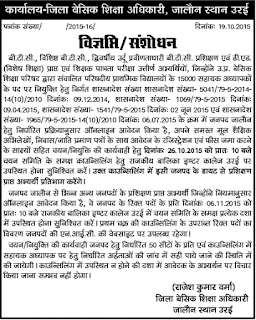 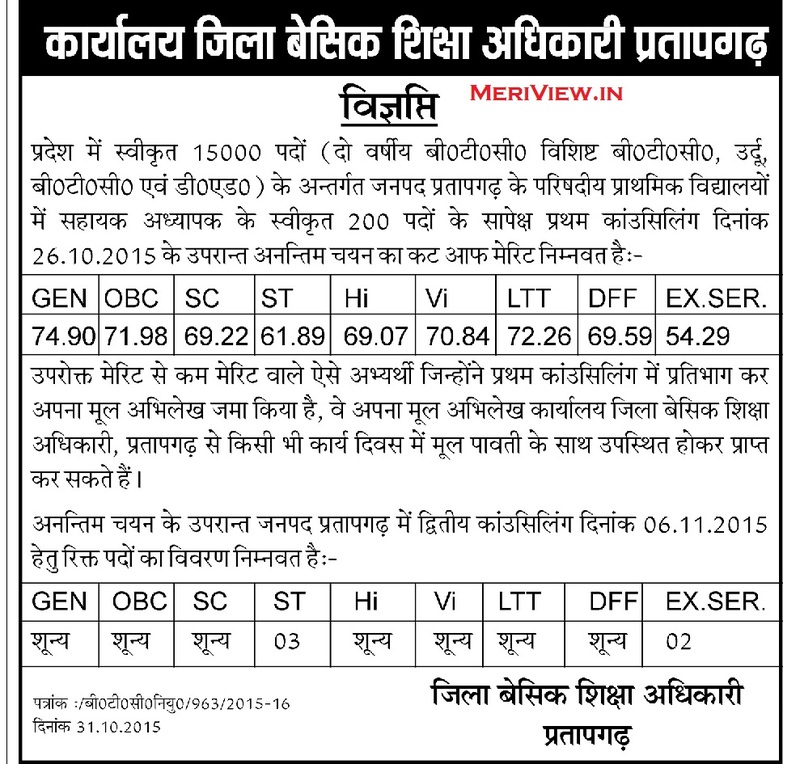 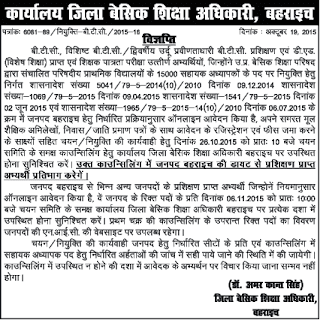 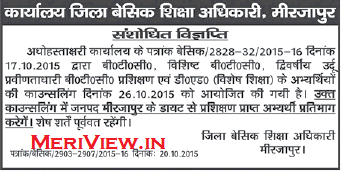 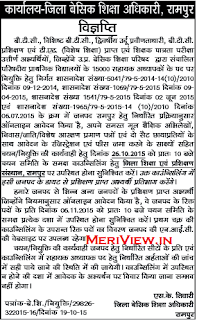 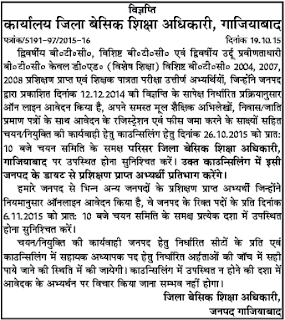 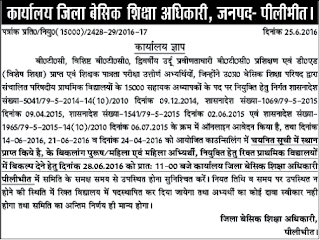 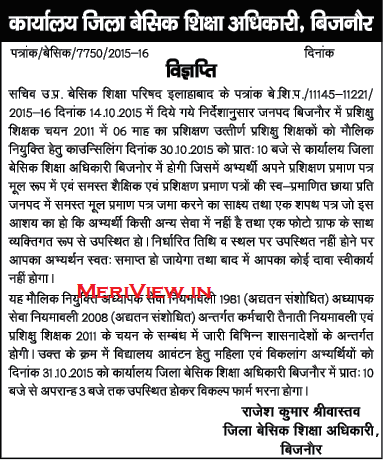 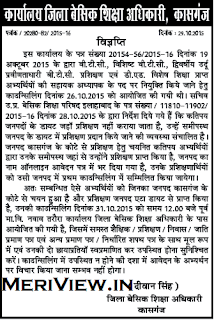 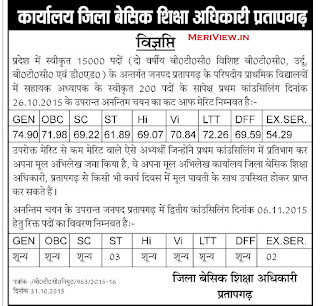 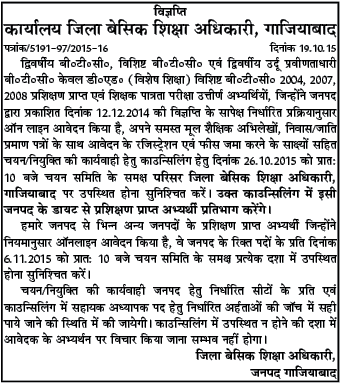 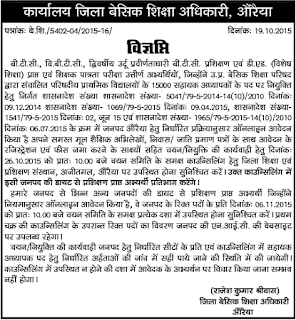 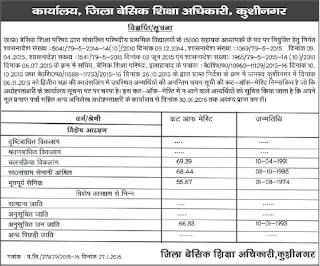 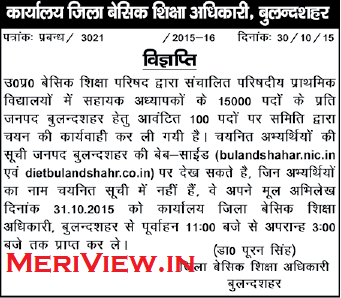 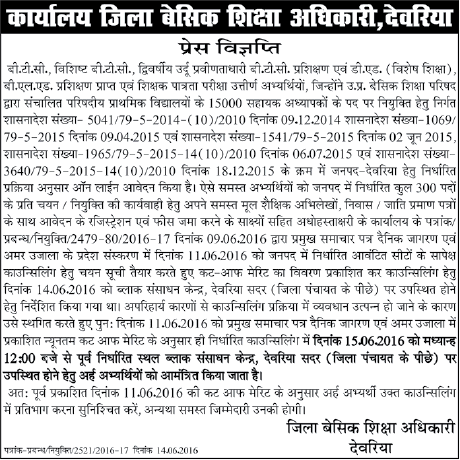 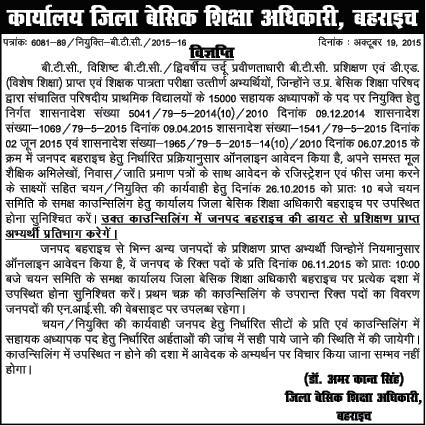 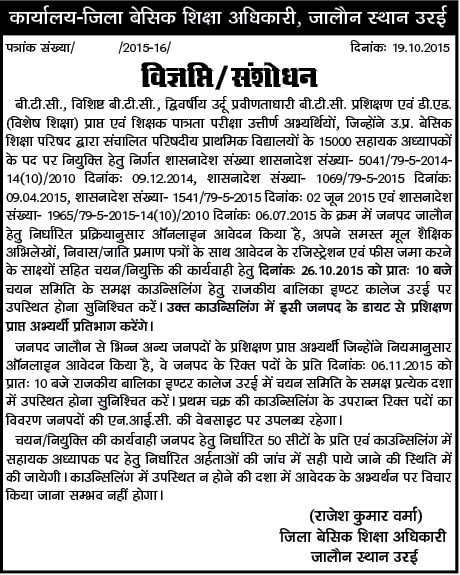 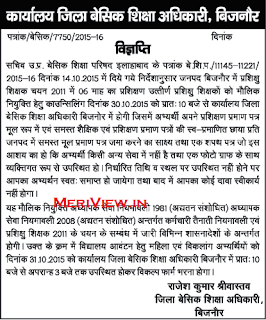 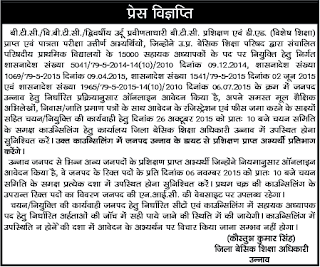 UP 15000 Teacher Vacancy Counselling date: Counselling will be held from 26 October 2015 onwords at respective diets. 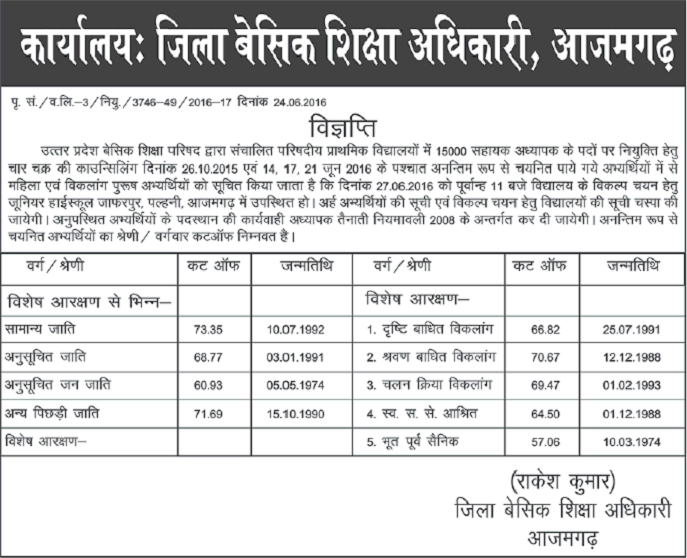 You can check detailed press release / vigyapti from below which were released by district diets. 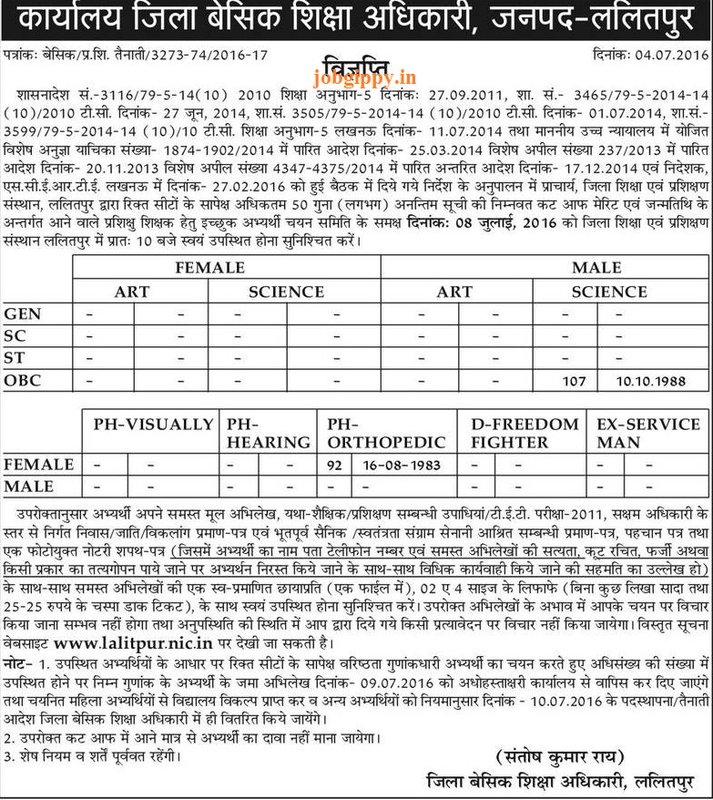 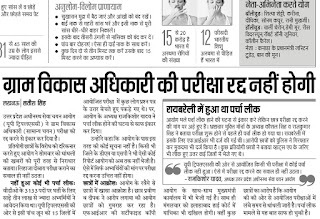 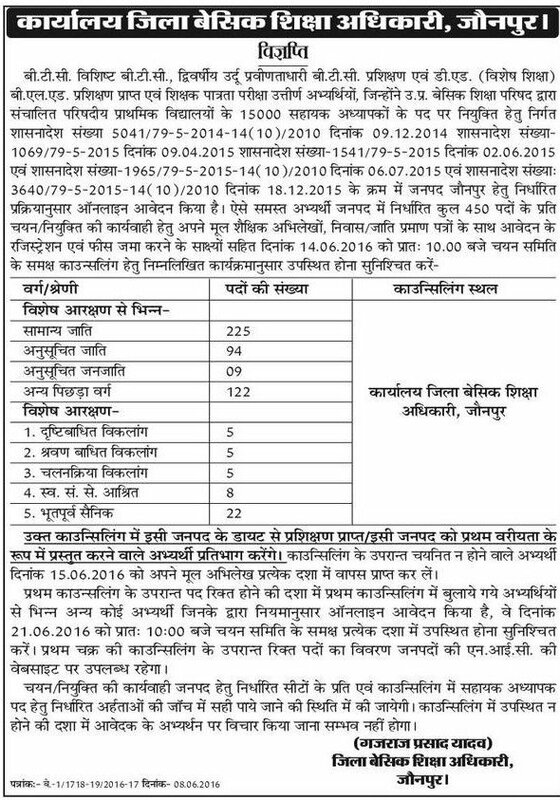 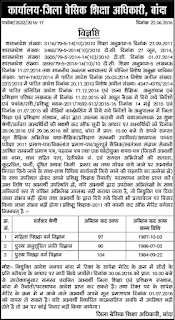 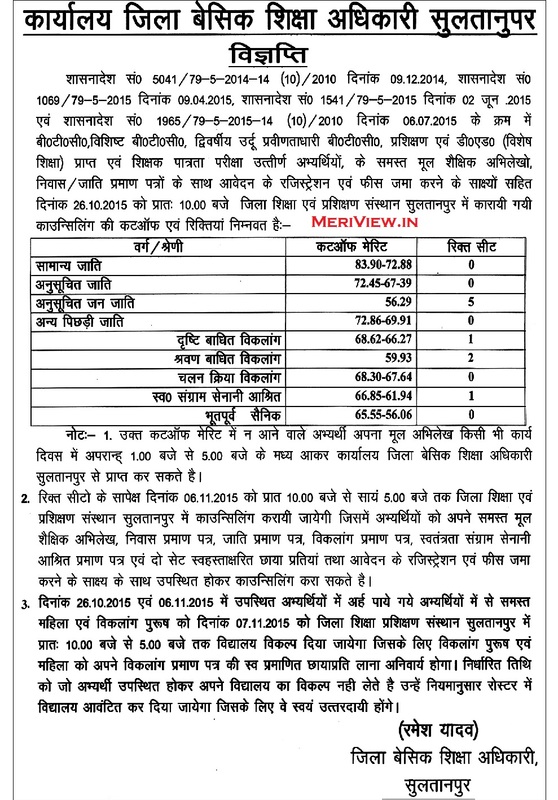 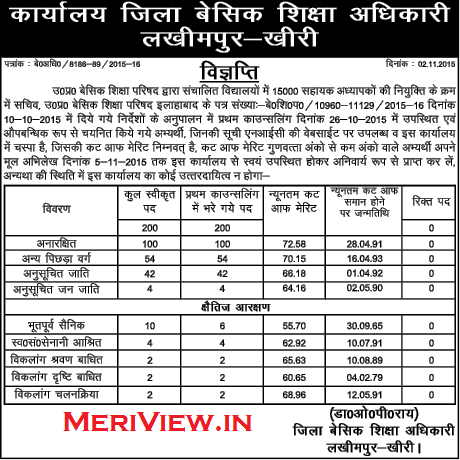 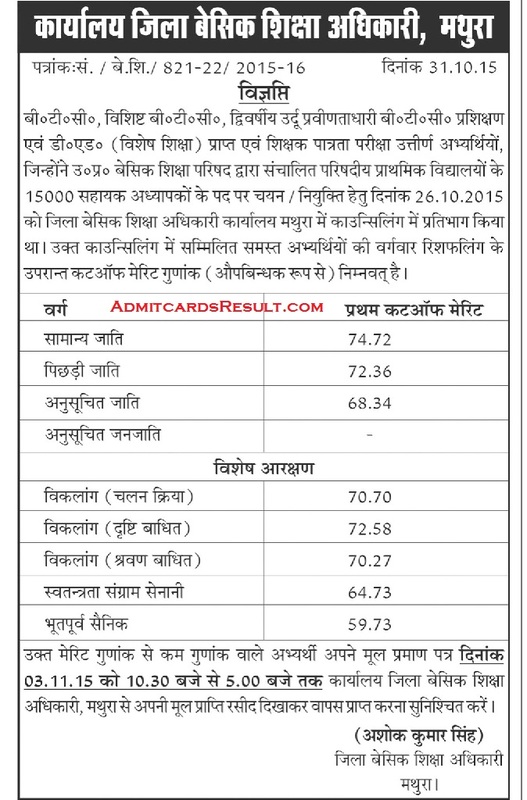 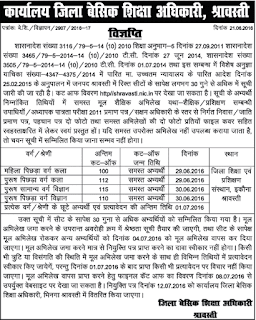 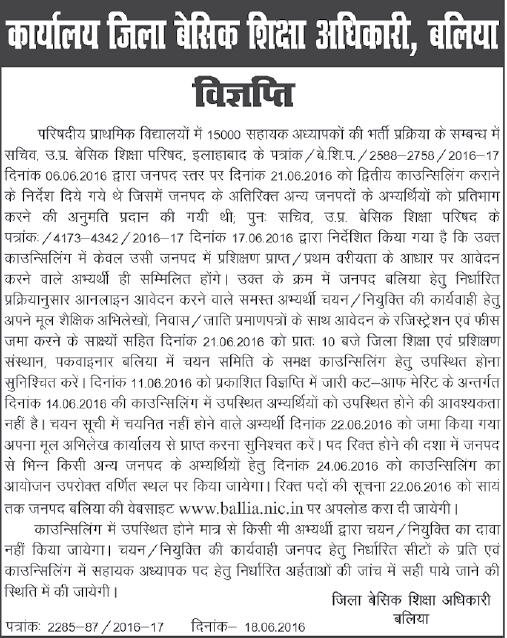 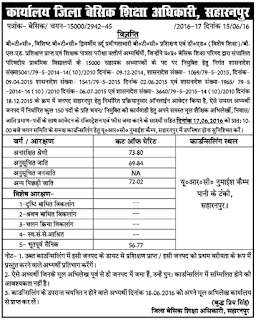 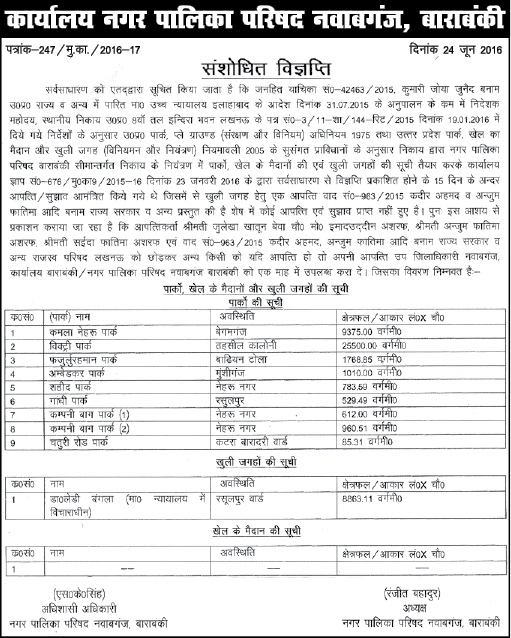 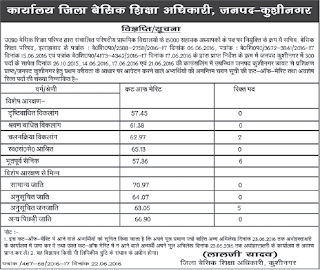 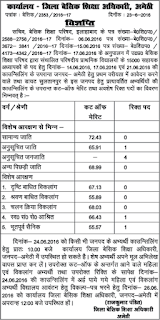 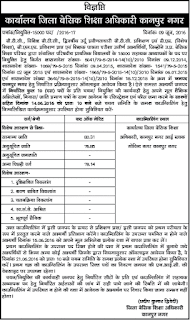 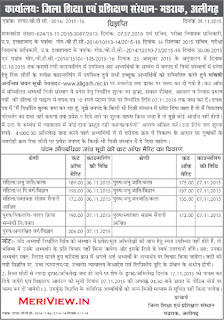 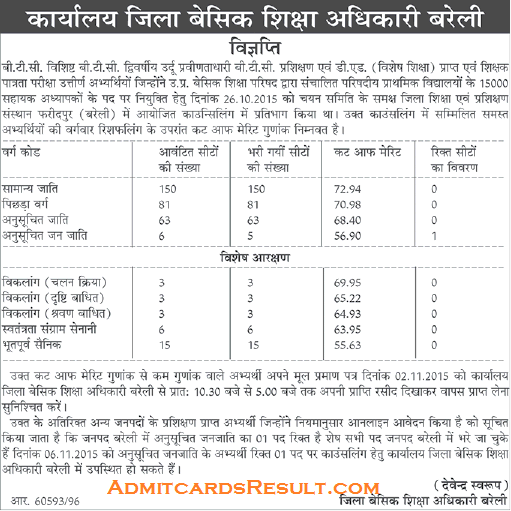 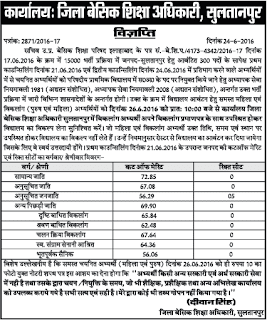 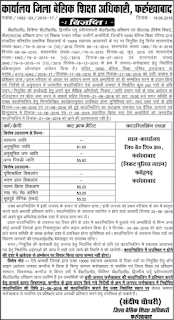 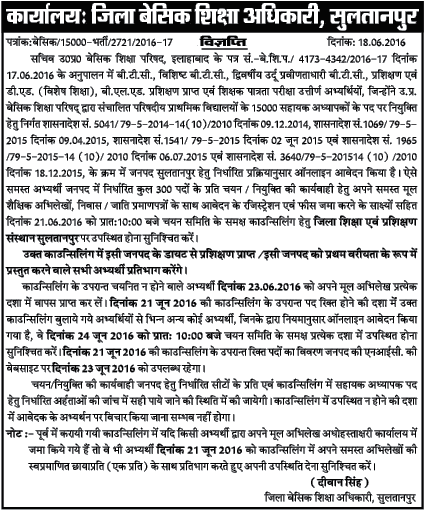 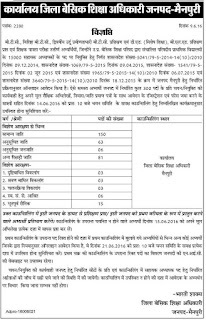 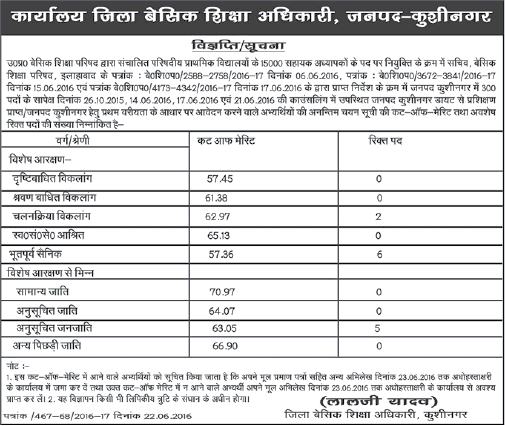 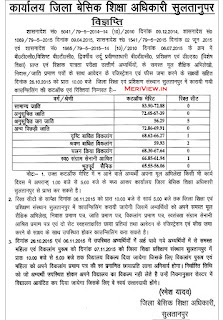 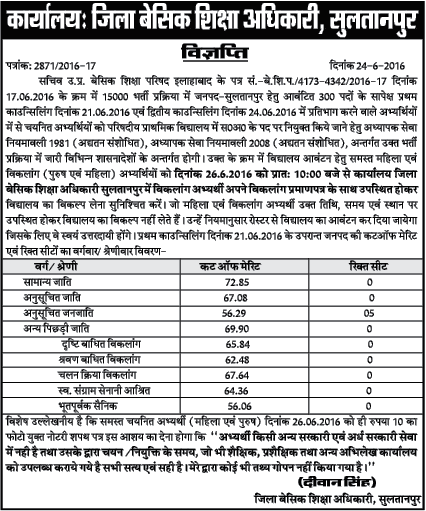 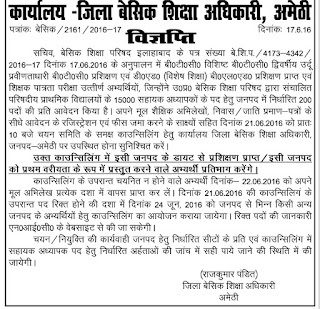 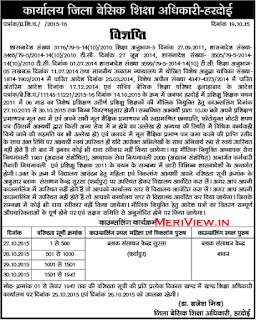 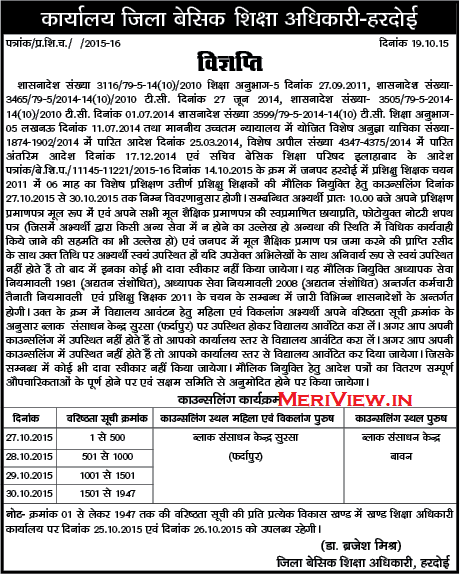 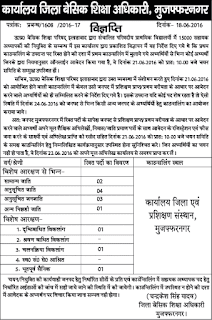 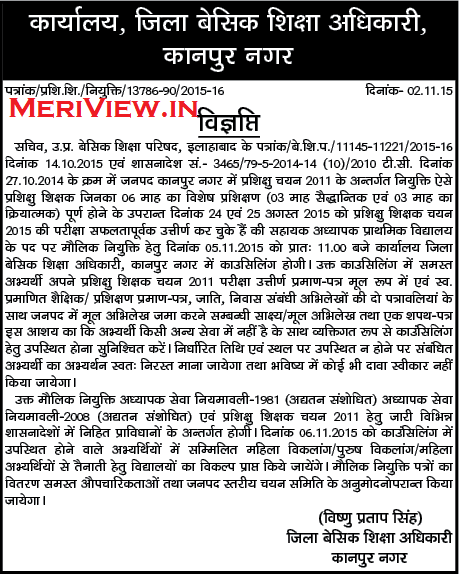 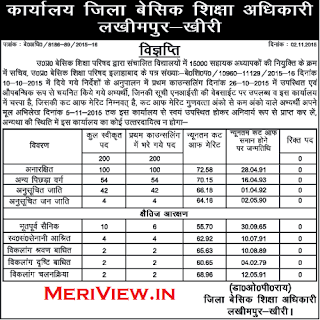 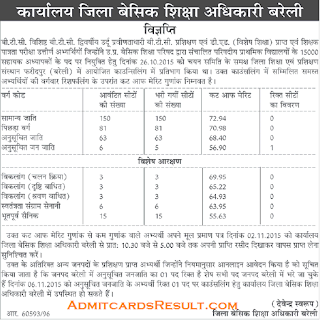 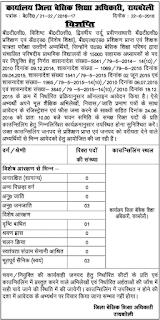 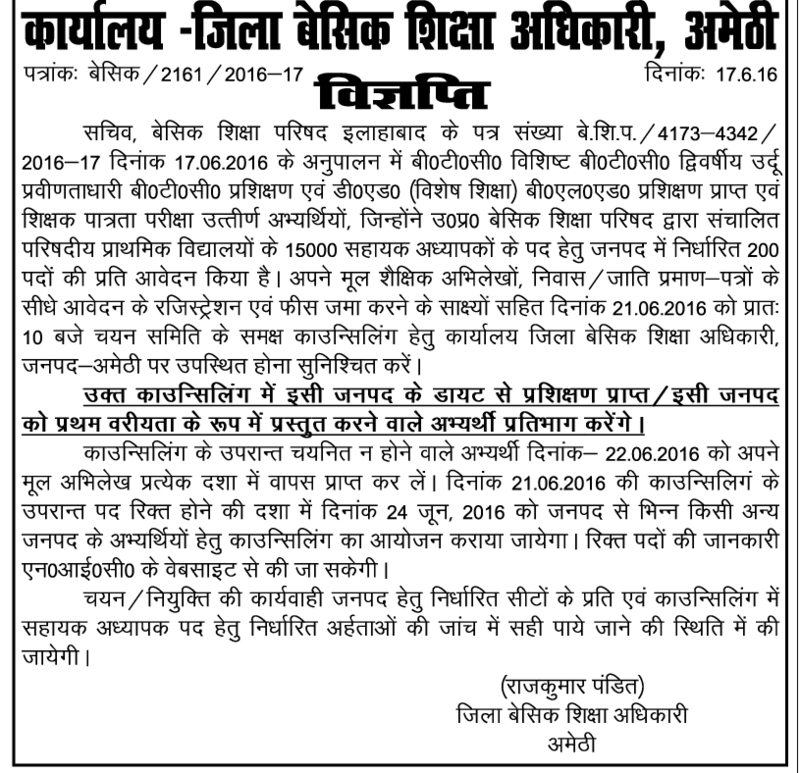 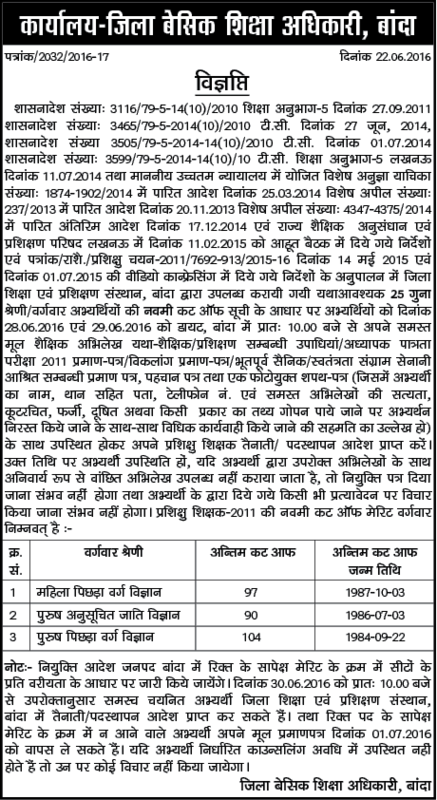 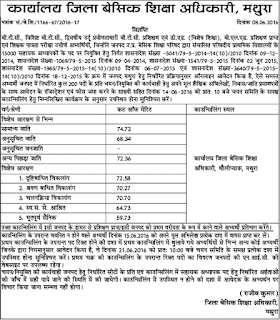 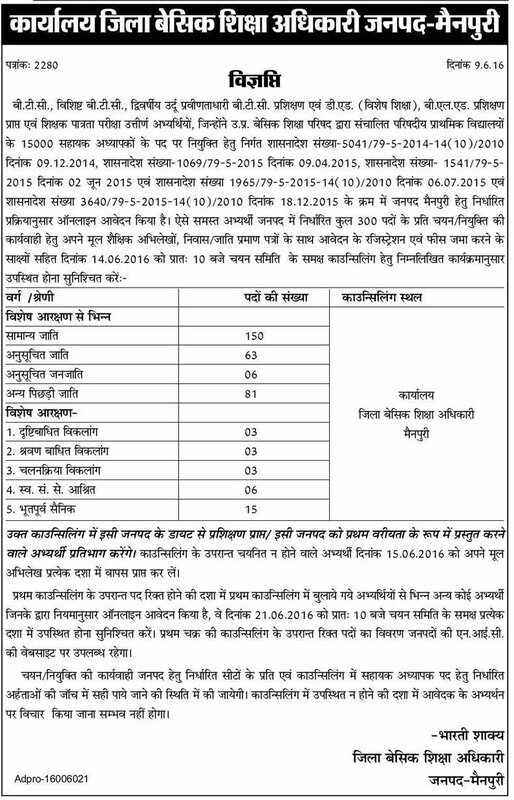 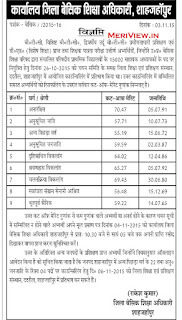 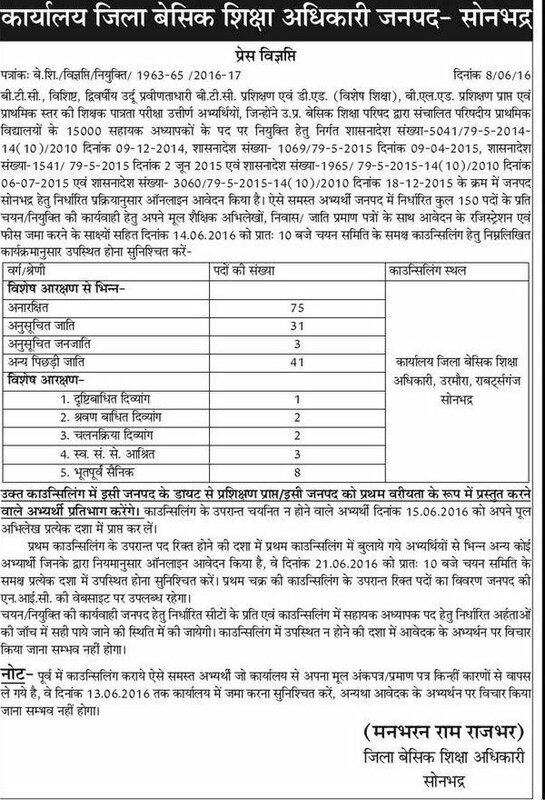 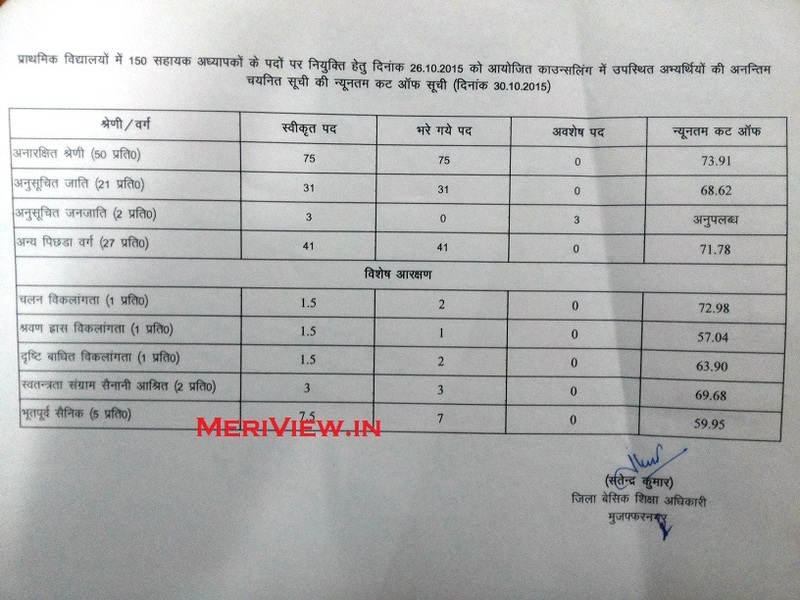 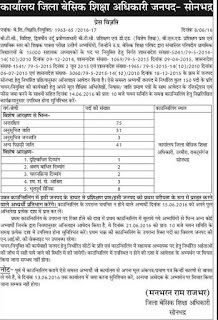 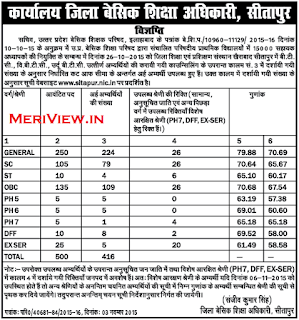 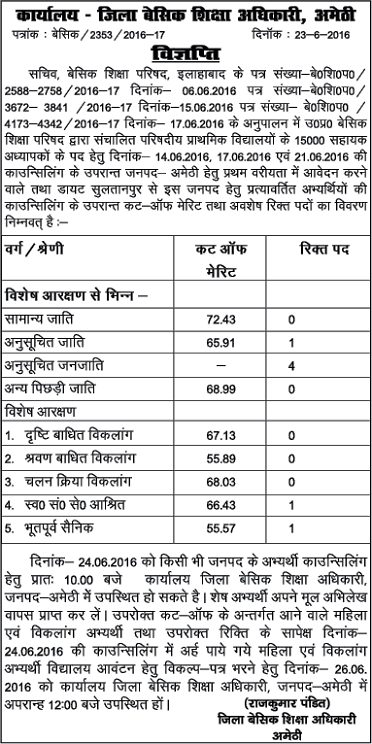 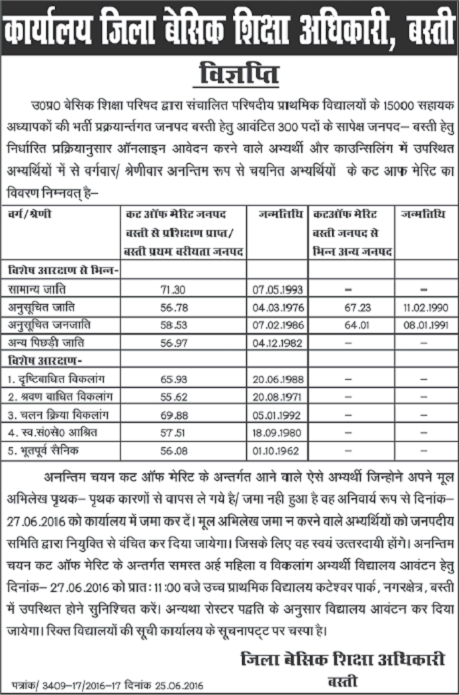 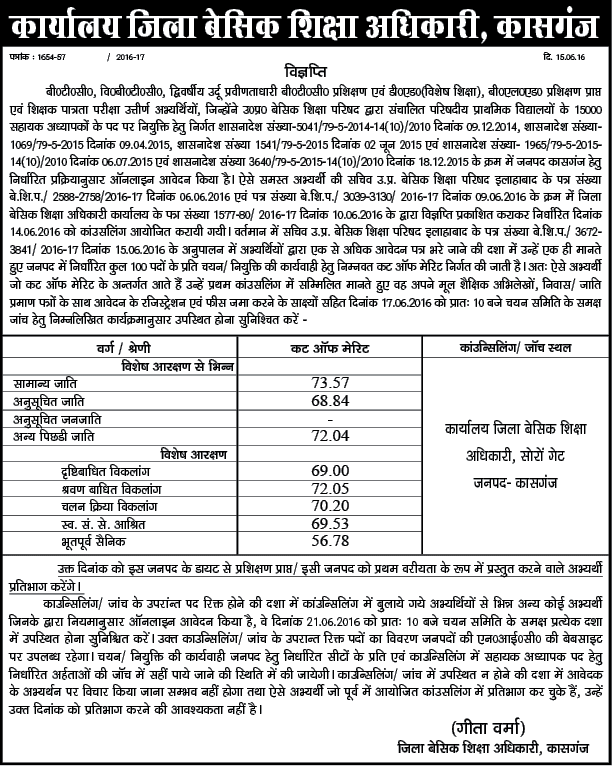 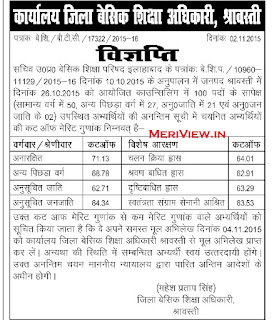 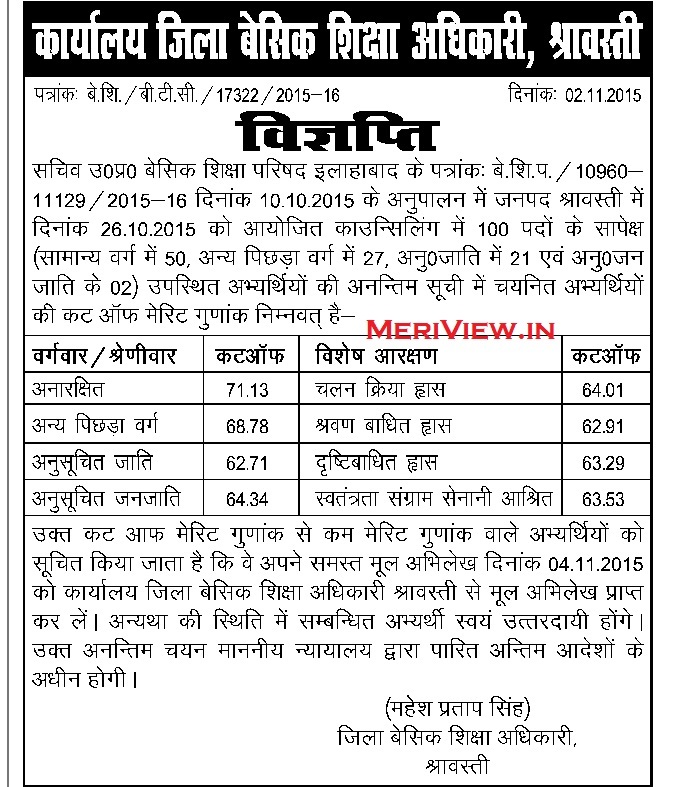 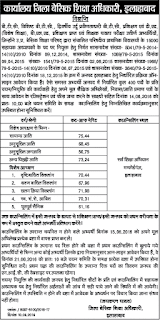 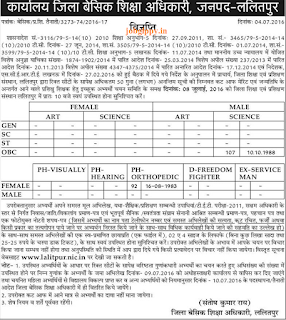 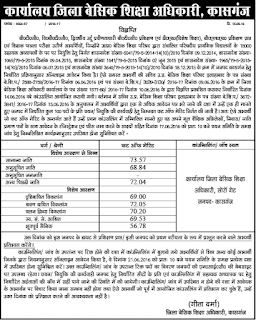 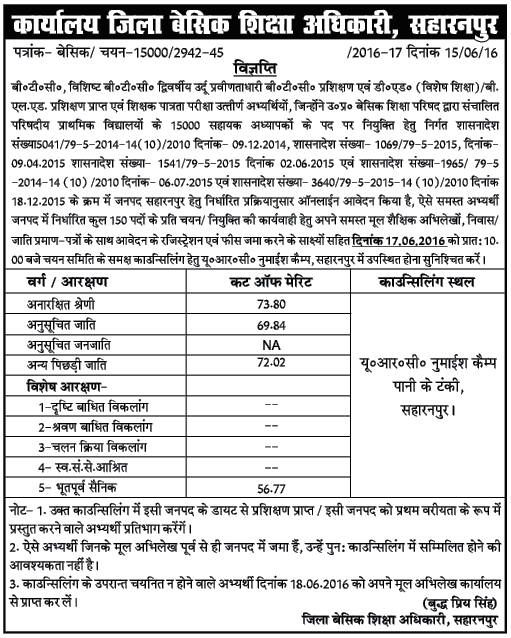 Earlier UP Basic Edu Parishad had invited applications for 15000 posts of Assistant Teacher in junior schools on 24 Dec 2014 for which the last date to apply was 20 February 2015. 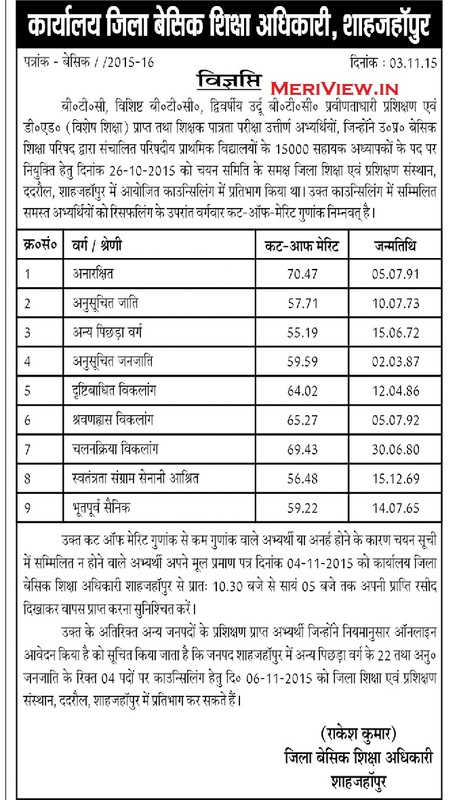 Also the list of UP district nic websites is provided to check status. 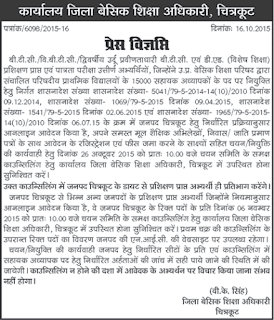 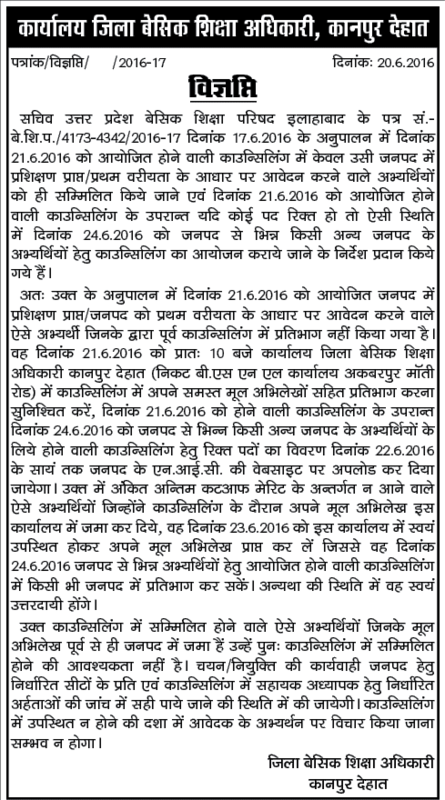 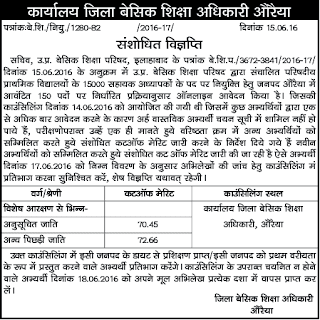 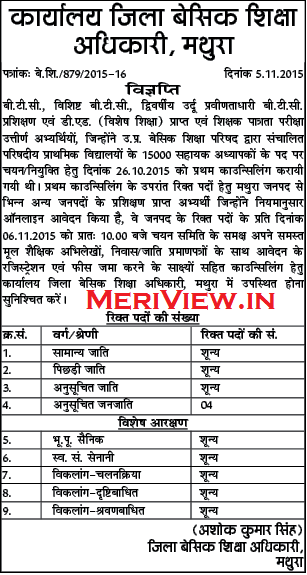 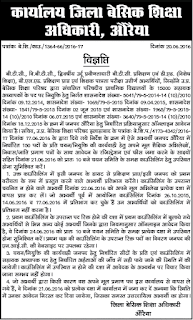 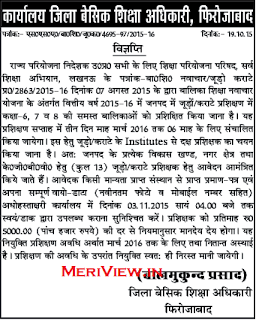 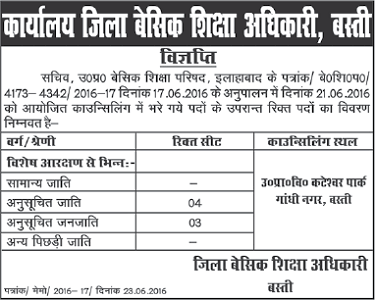 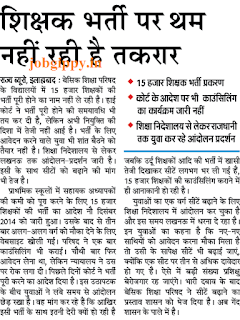 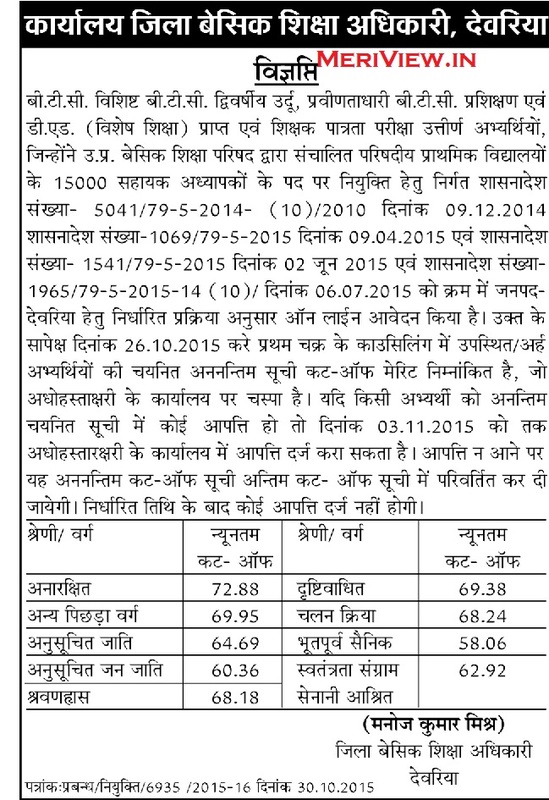 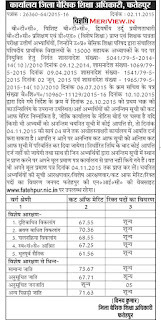 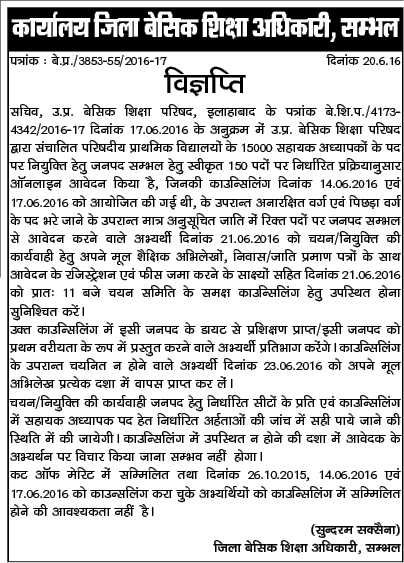 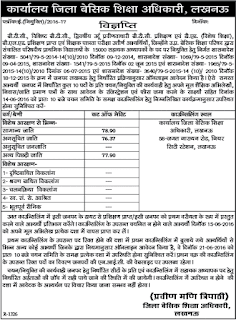 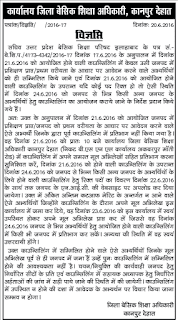 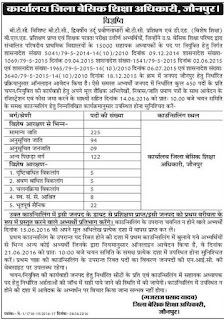 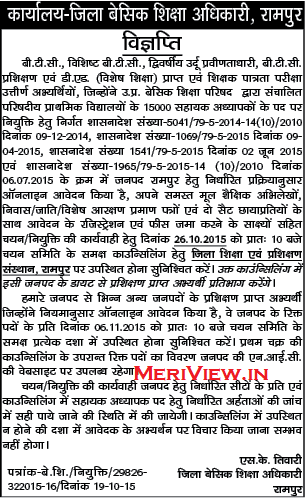 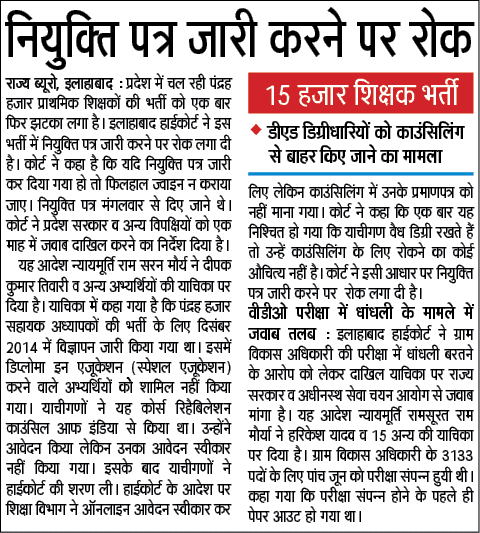 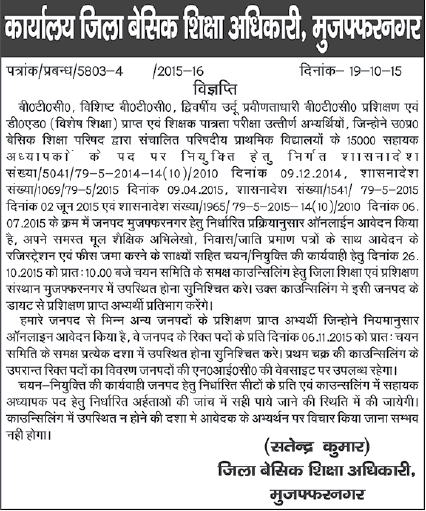 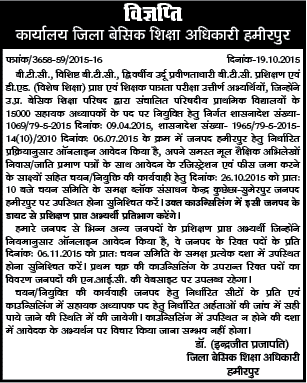 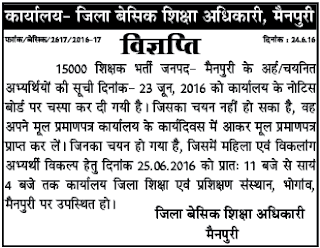 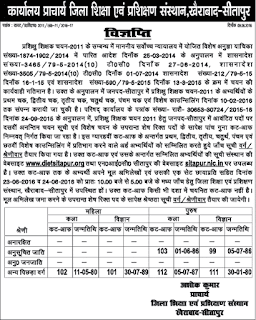 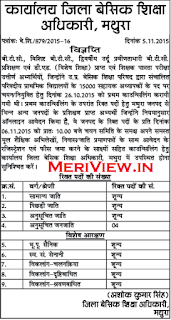 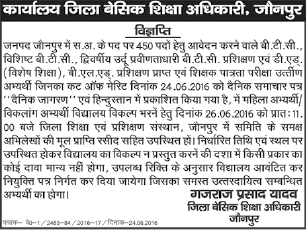 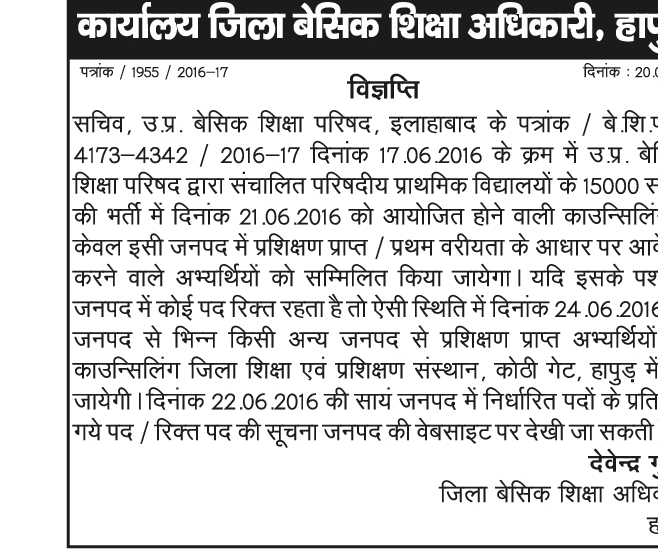 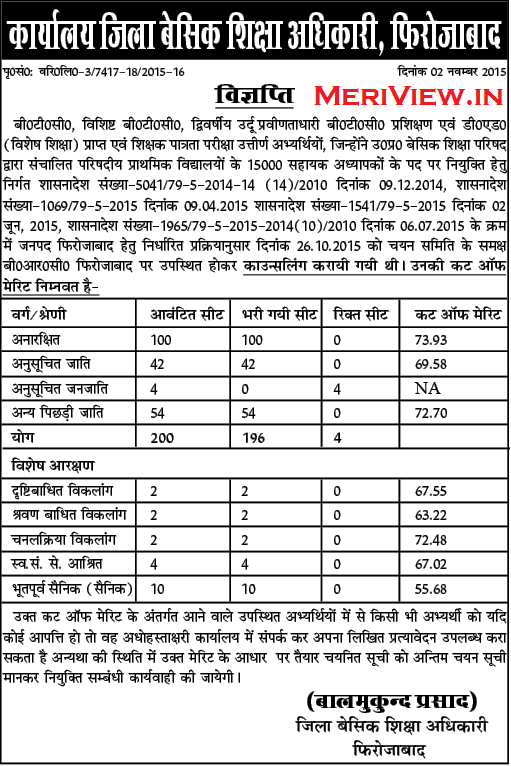 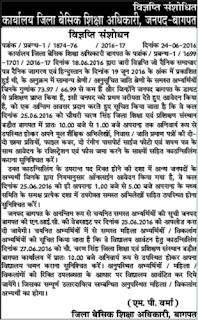 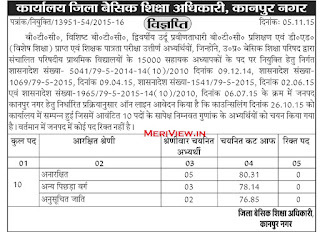 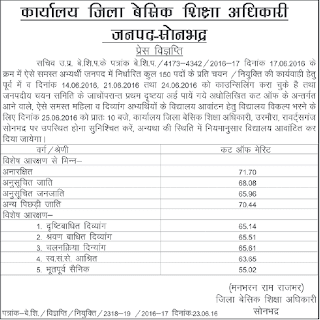 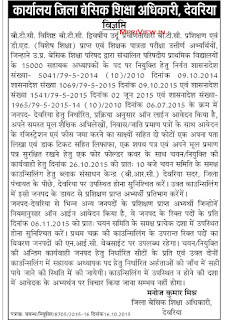 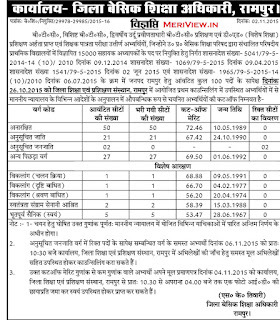 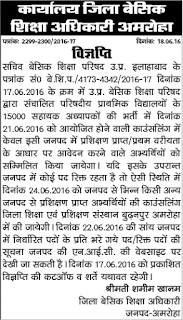 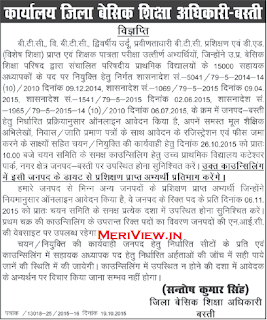 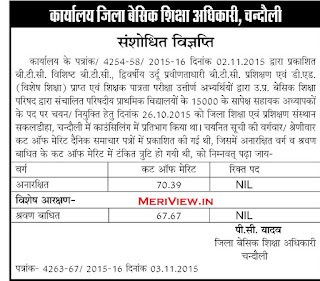 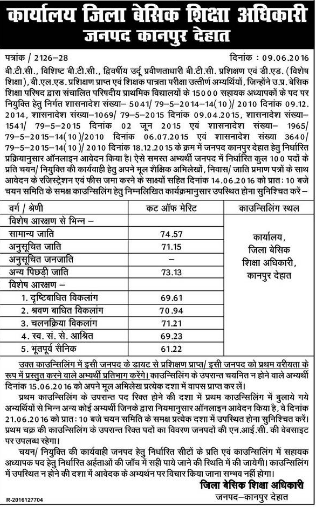 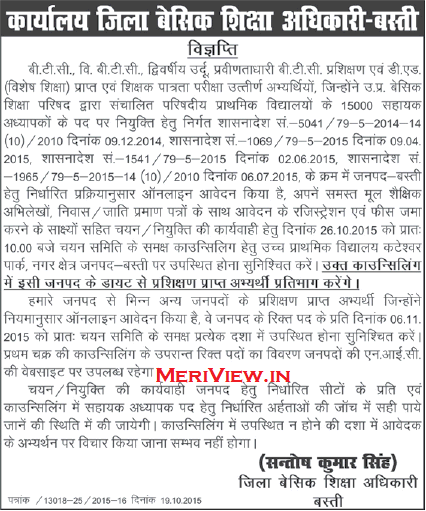 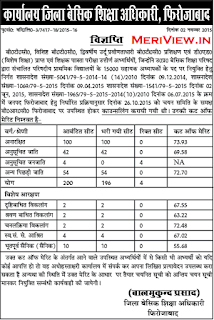 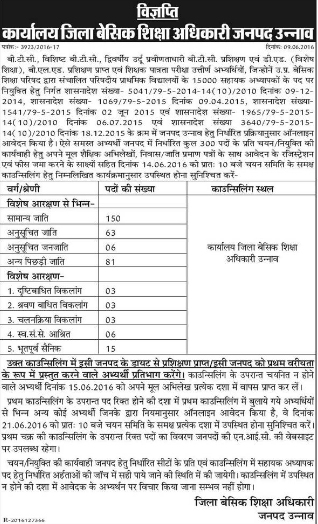 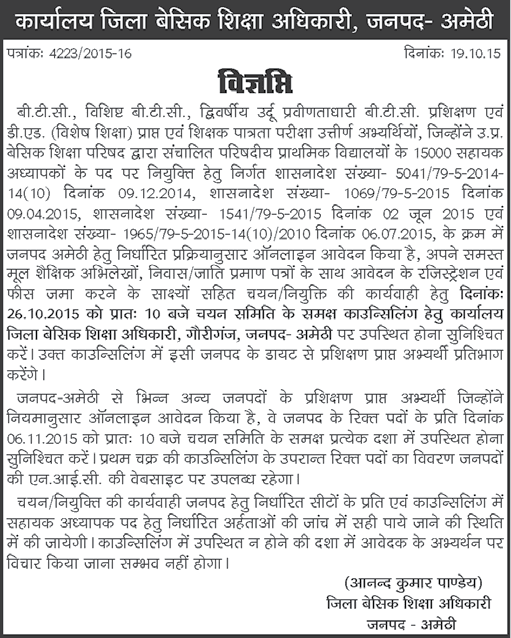 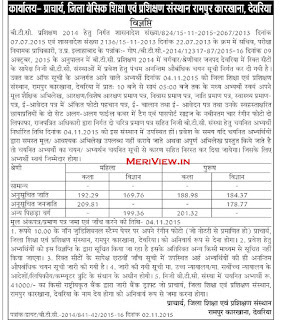 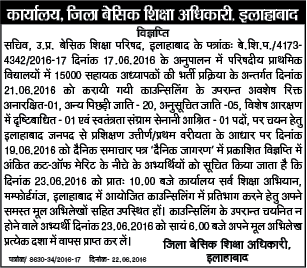 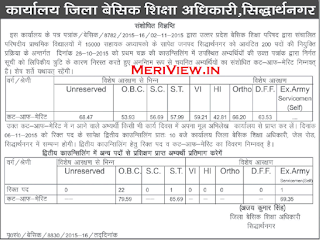 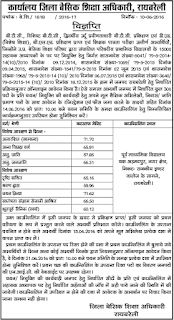 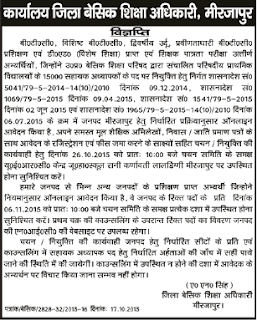 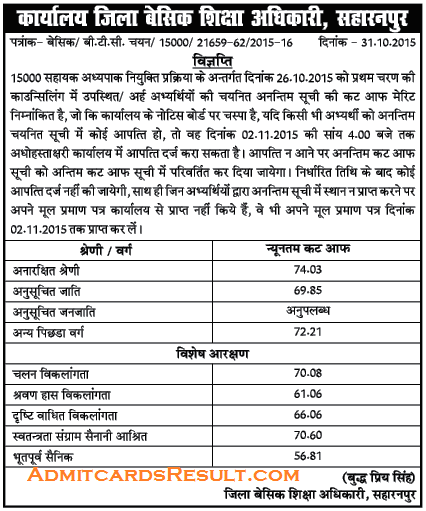 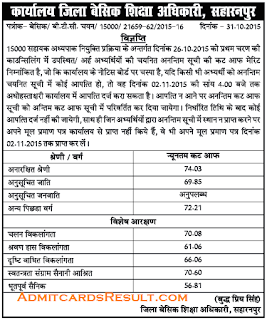 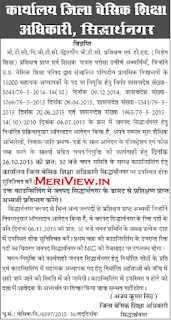 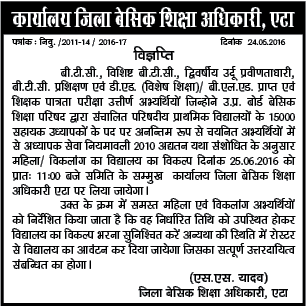 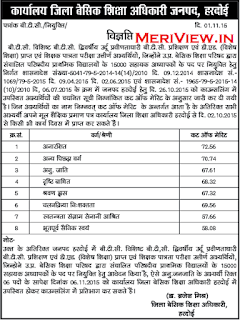 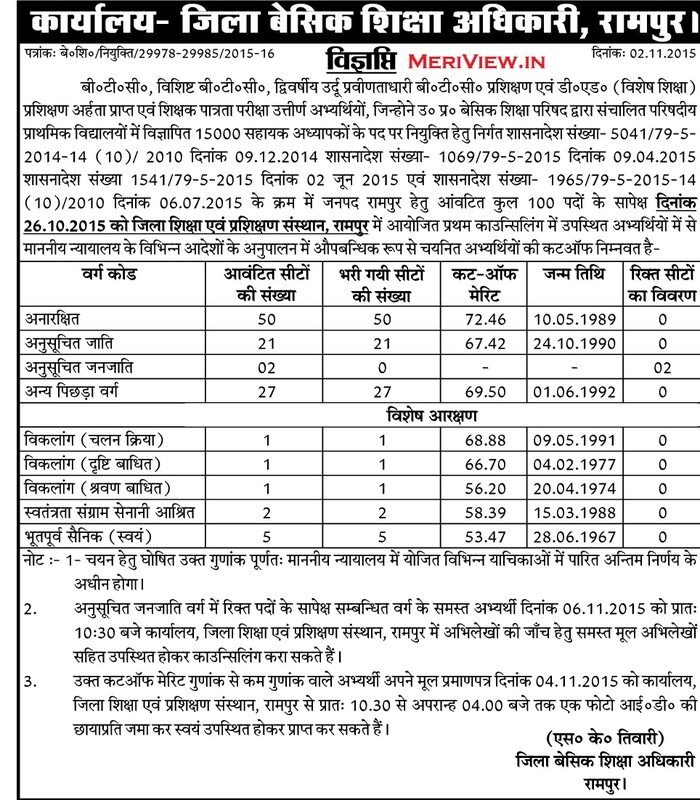 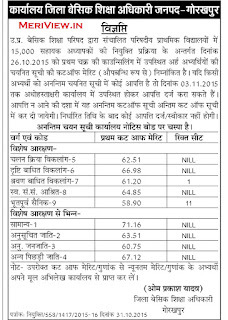 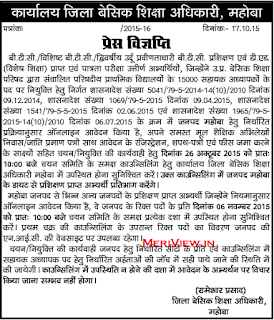 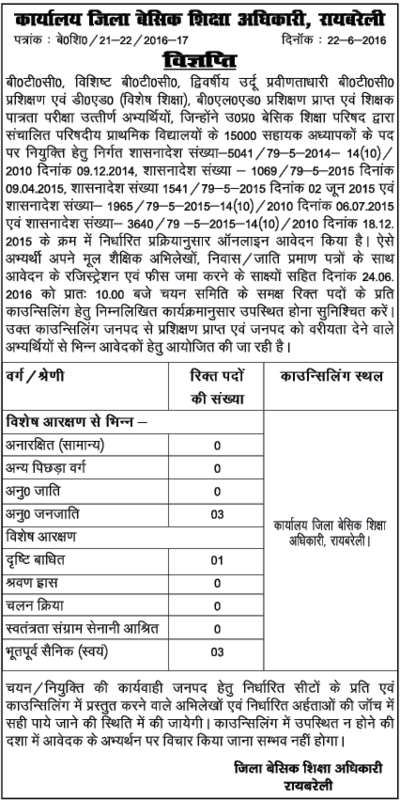 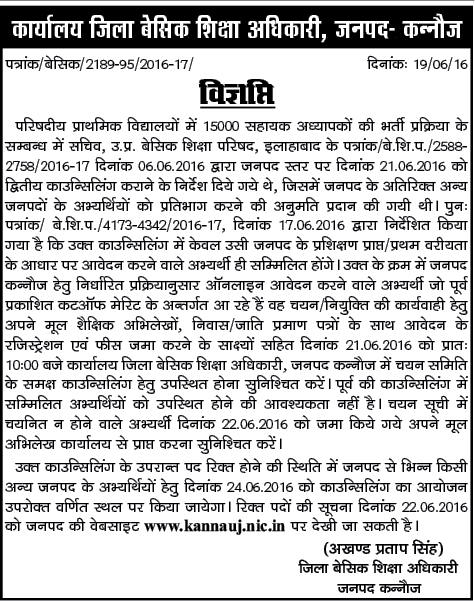 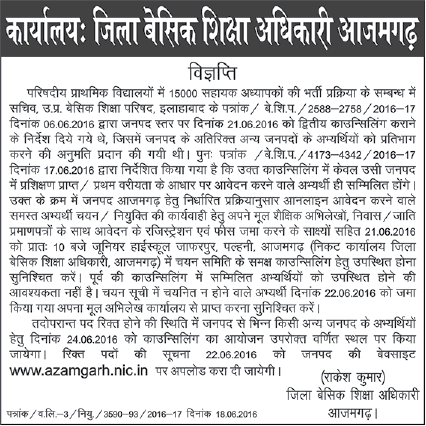 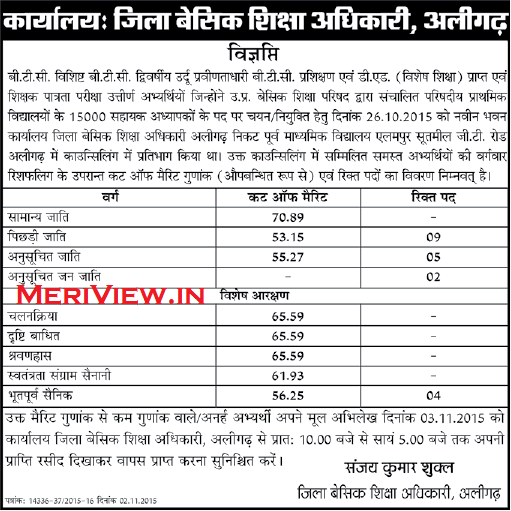 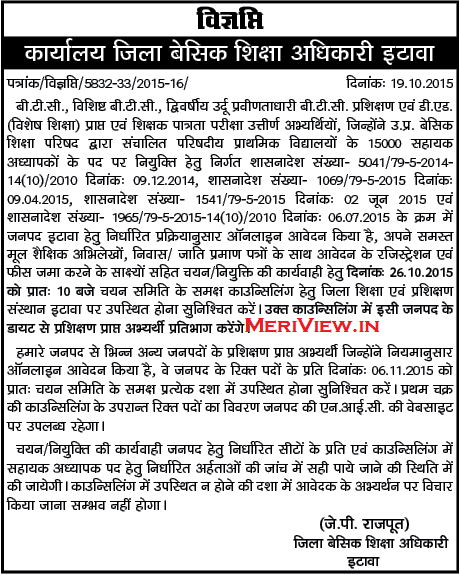 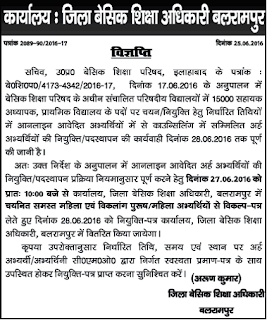 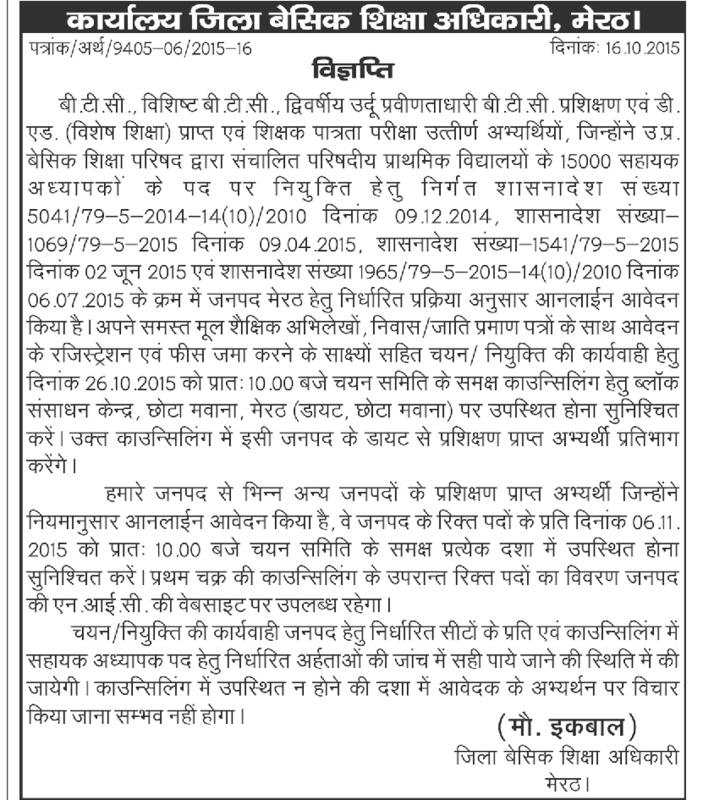 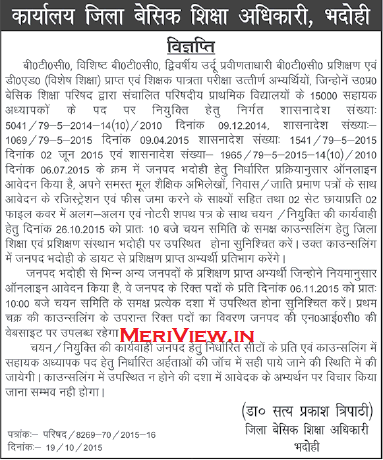 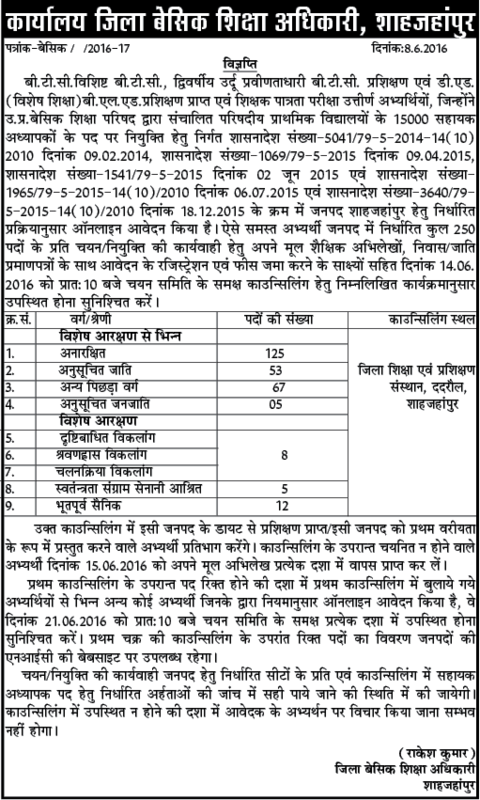 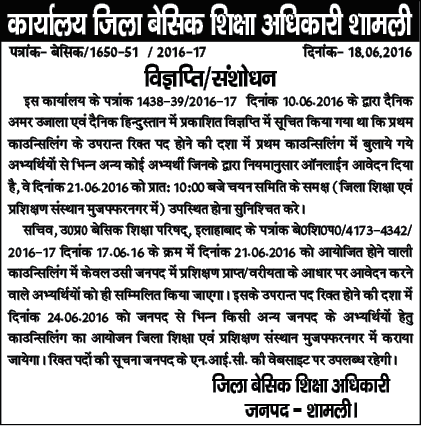 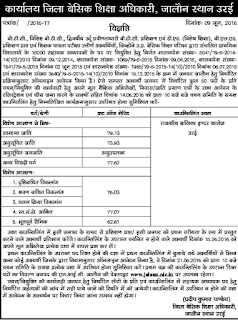 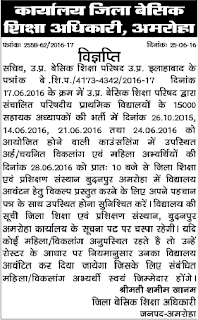 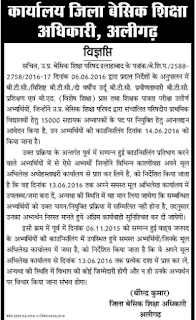 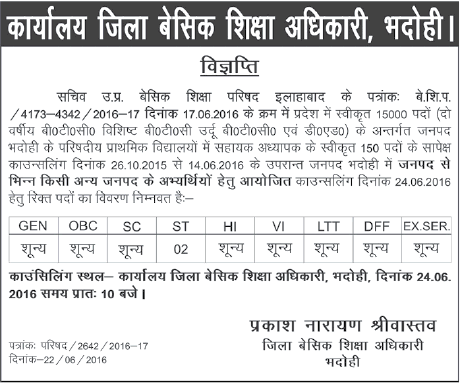 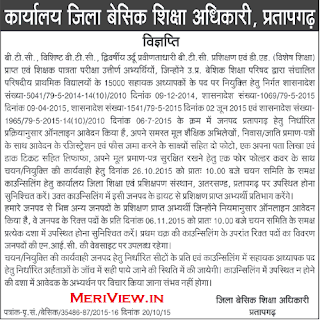 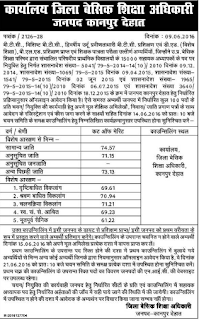 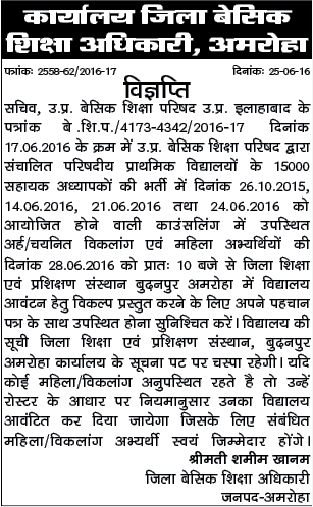 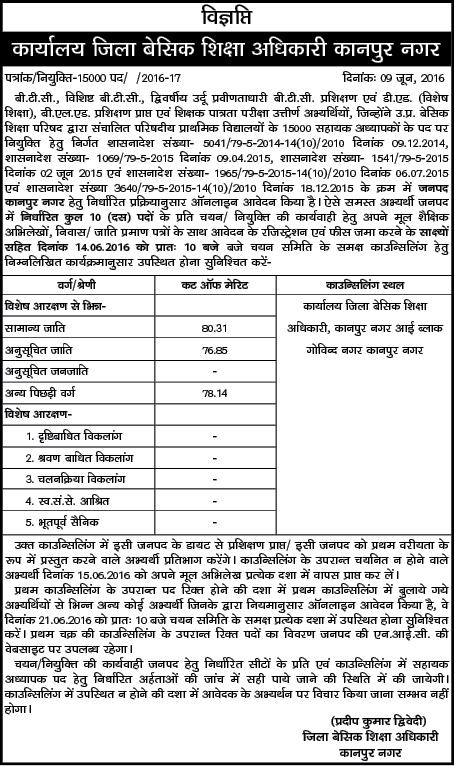 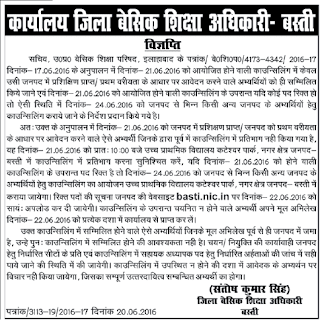 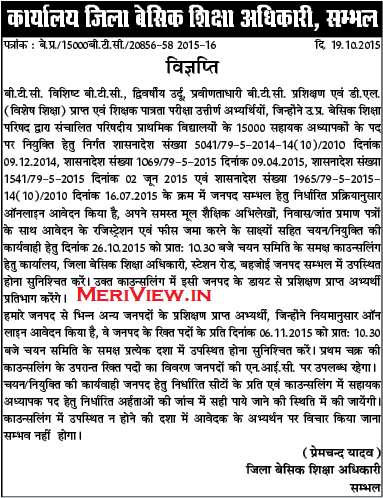 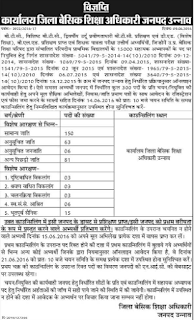 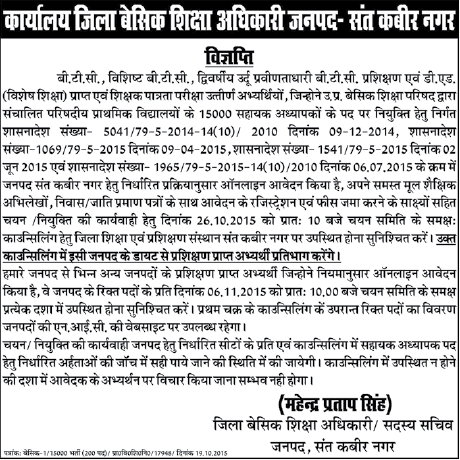 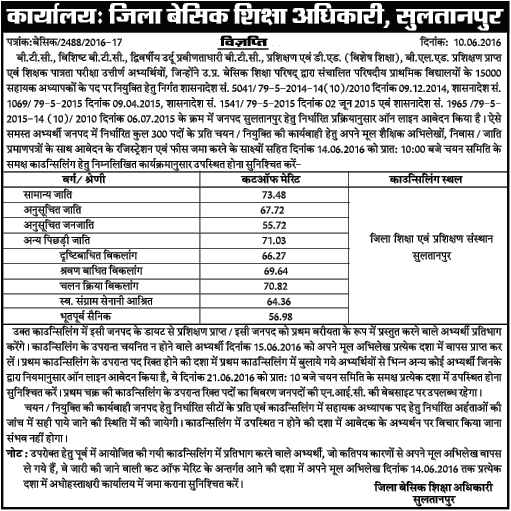 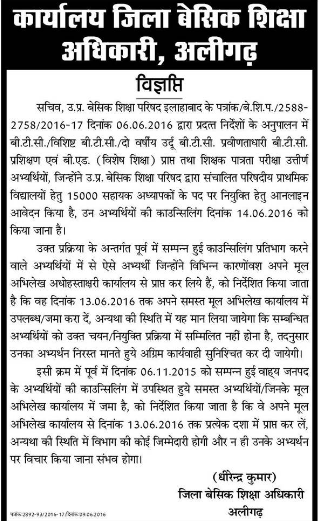 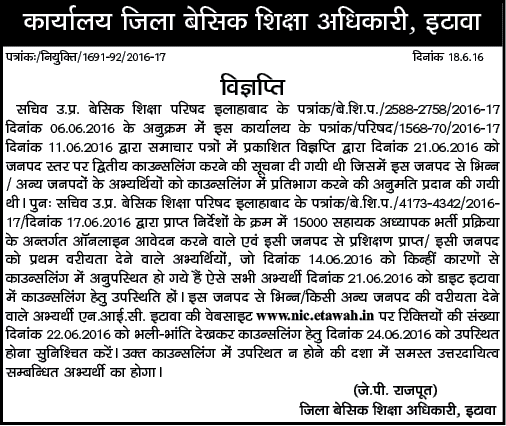 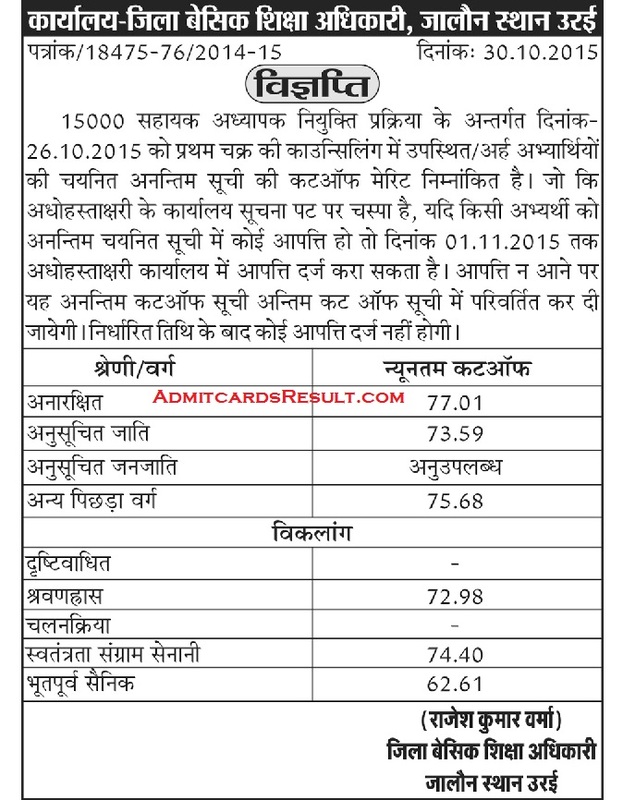 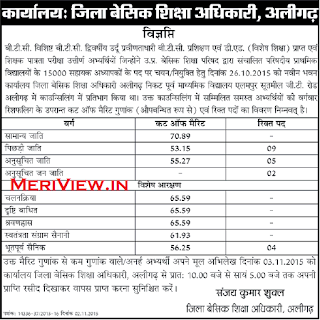 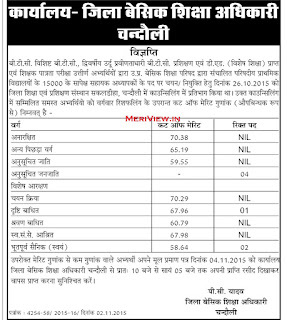 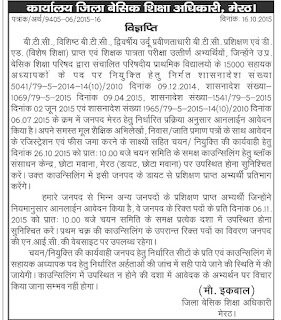 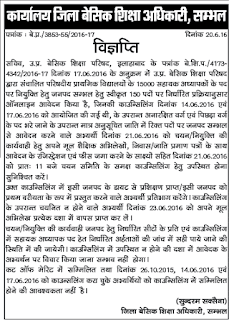 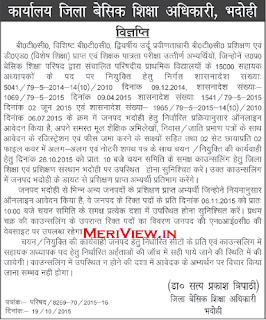 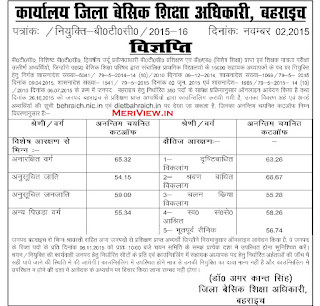 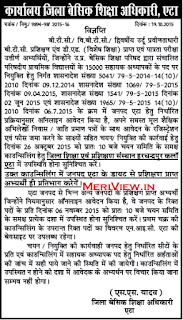 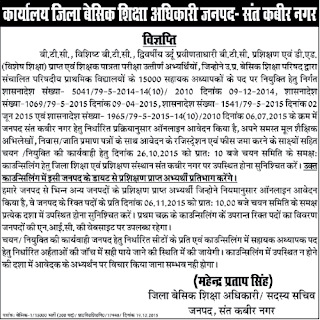 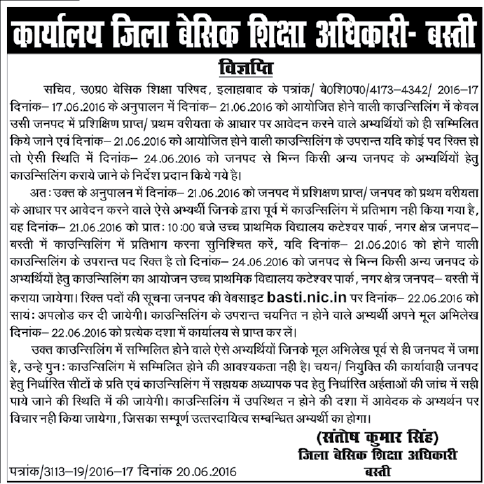 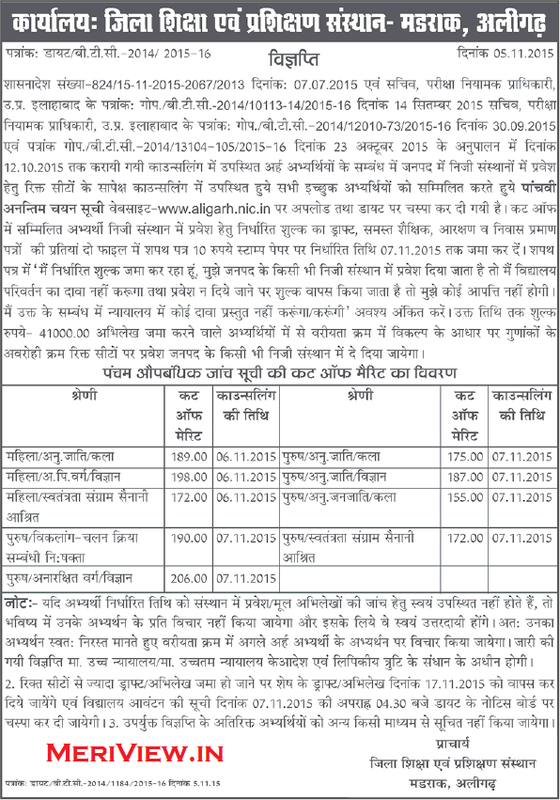 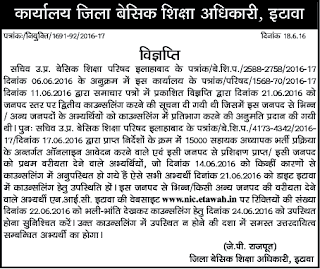 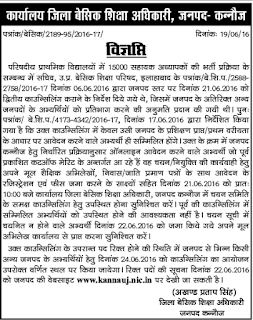 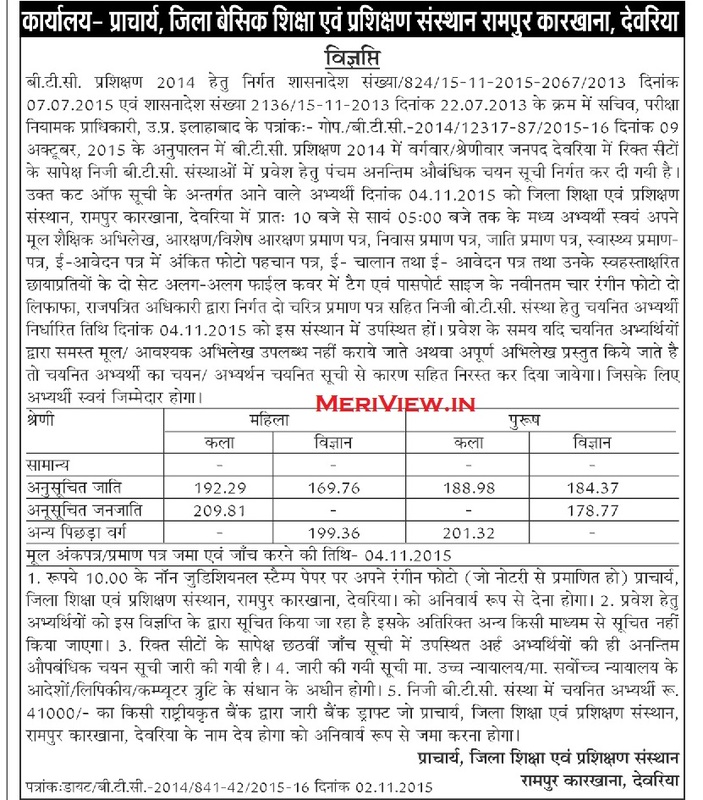 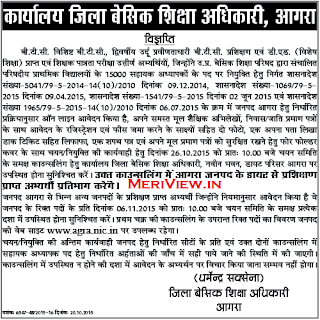 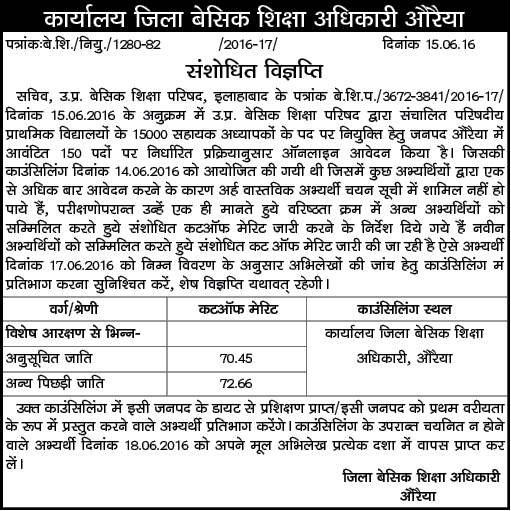 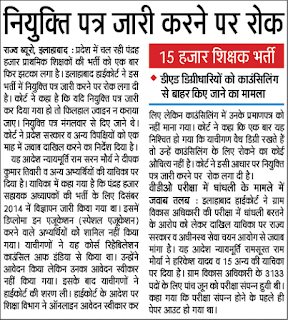 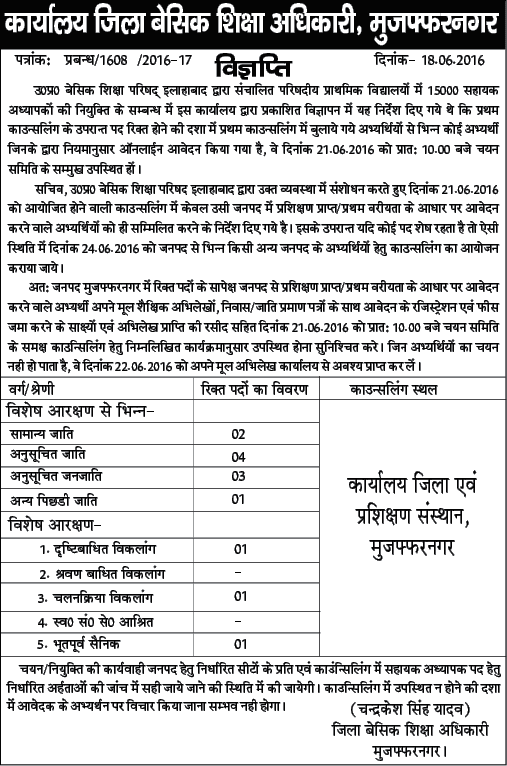 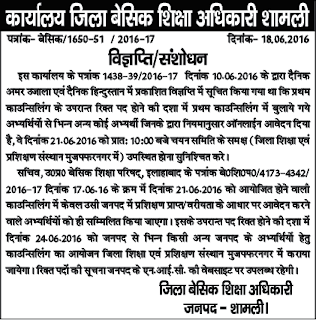 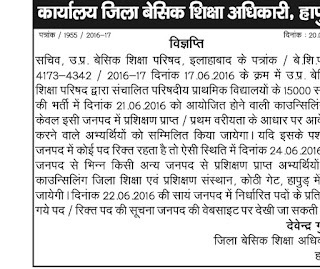 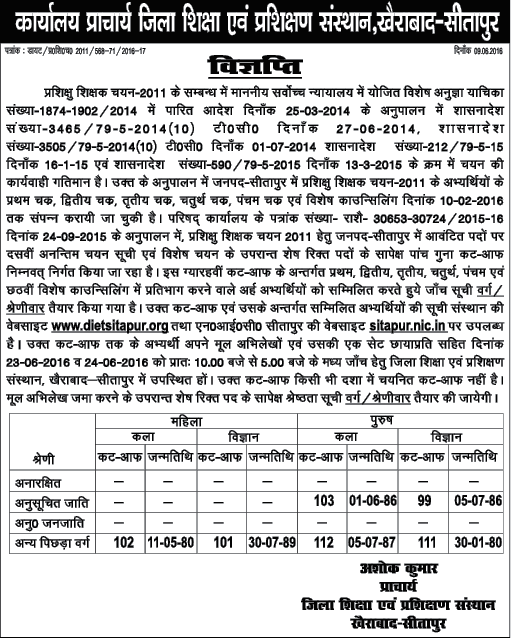 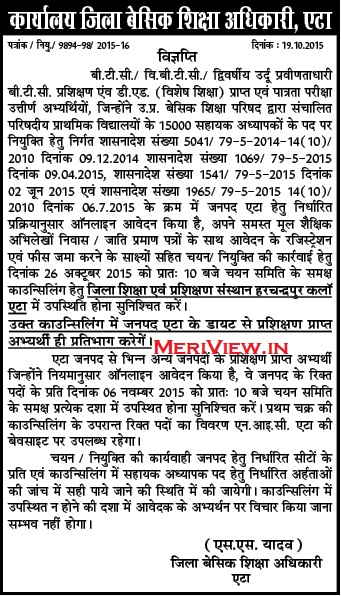 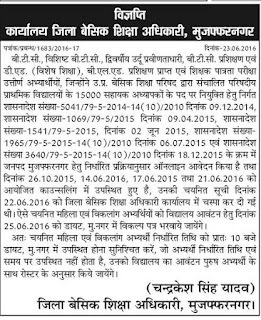 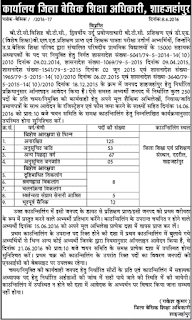 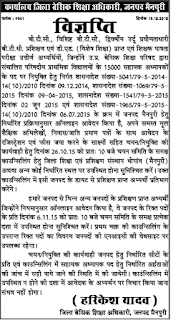 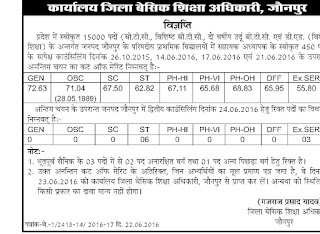 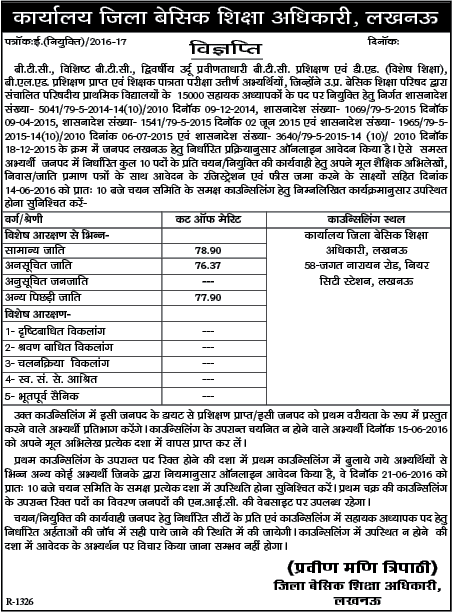 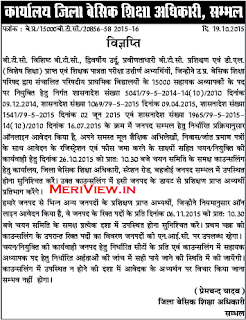 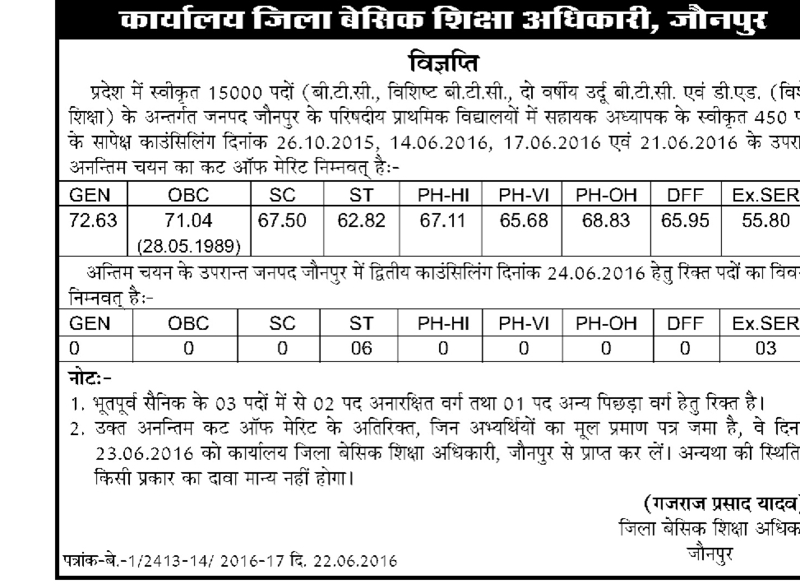 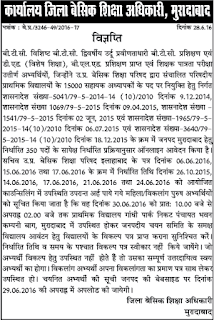 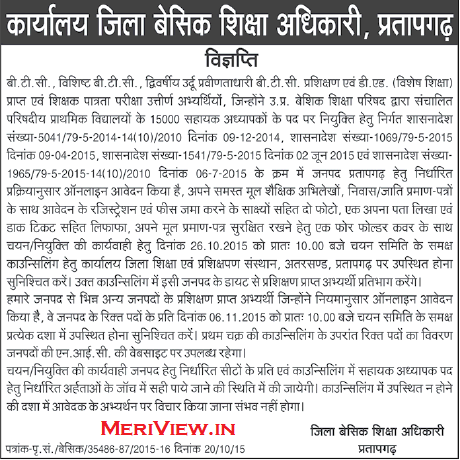 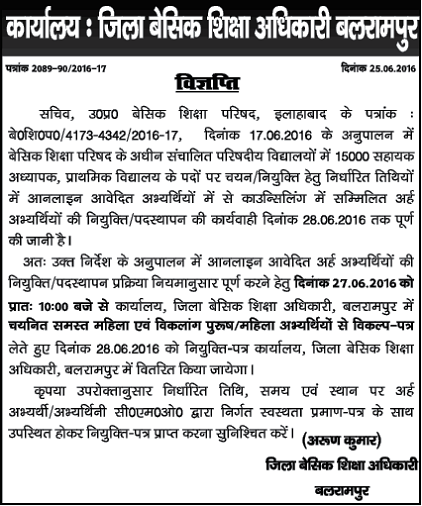 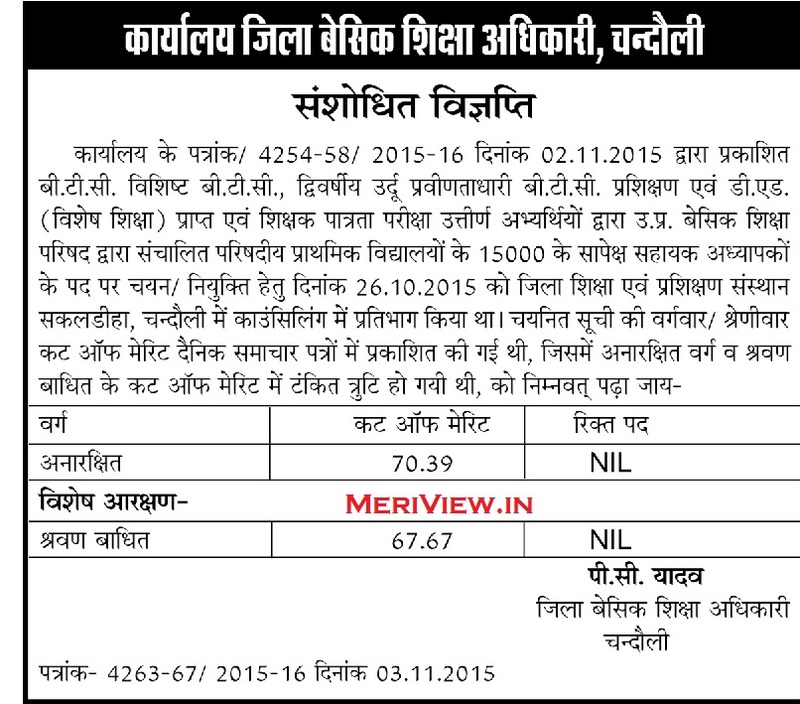 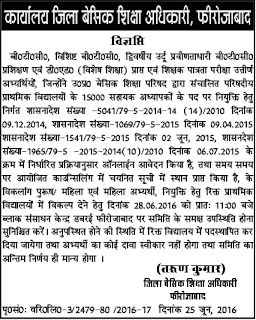 UP 15000 Teacher 1st Counselling date Cut off updates will be available here. 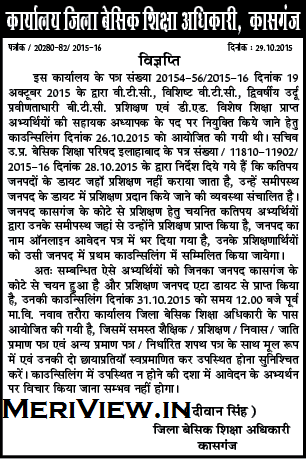 This 1st counselling will be held from 26 October 2015. 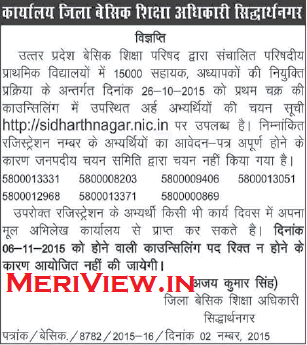 Click on the district to check Asst. 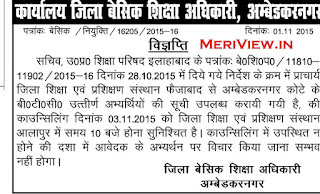 Teacher merit directly. 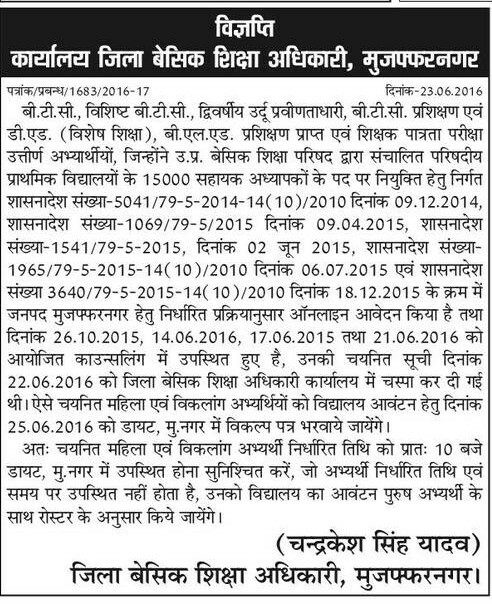 Counselling date is available for most of the districts. 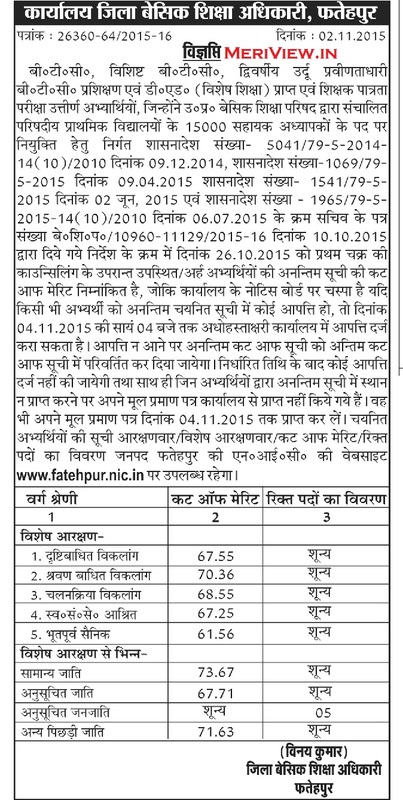 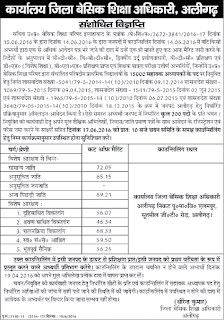 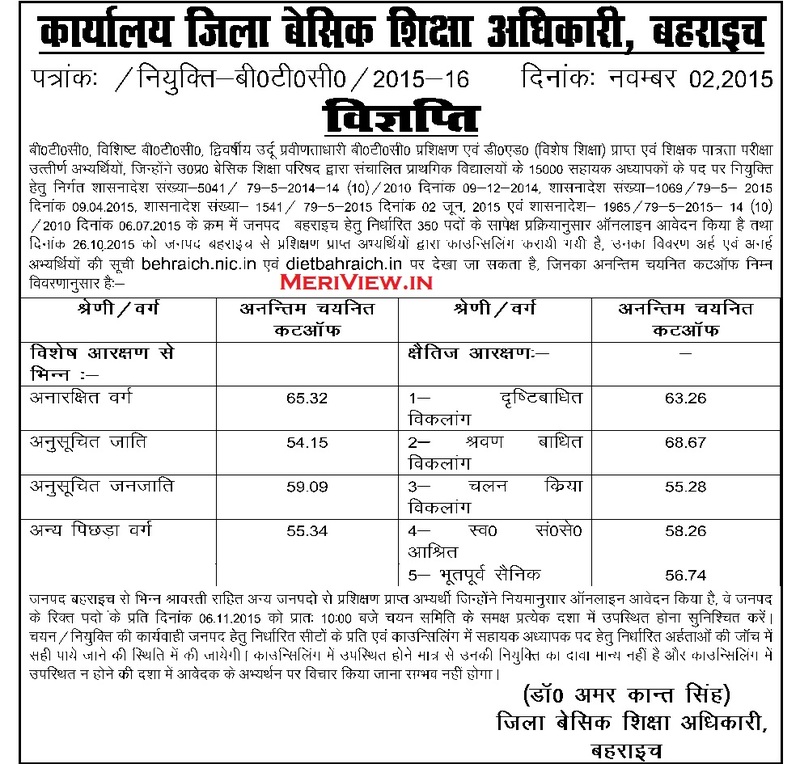 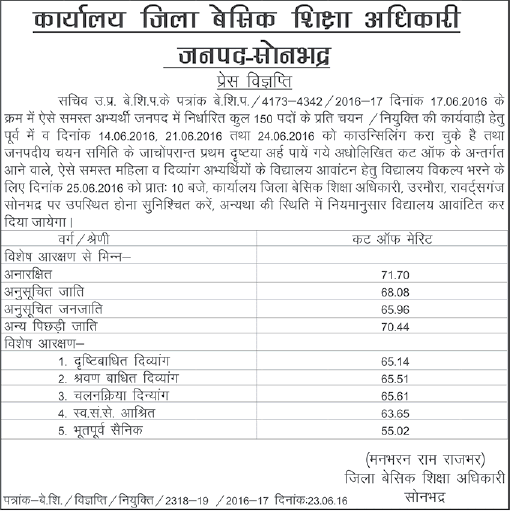 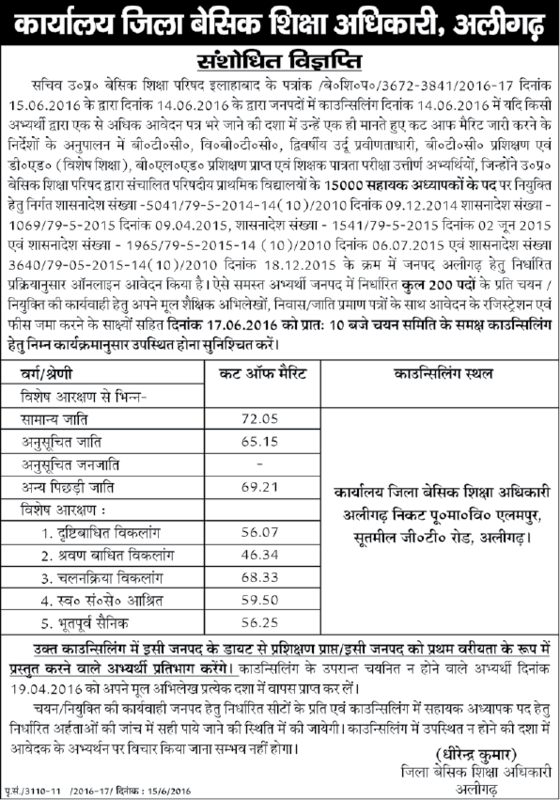 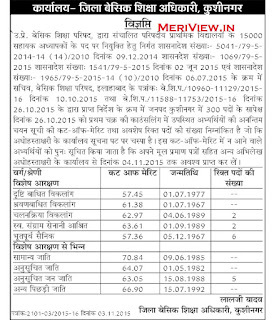 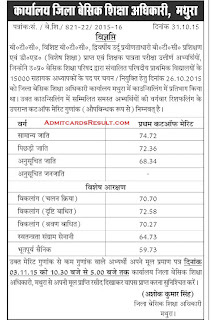 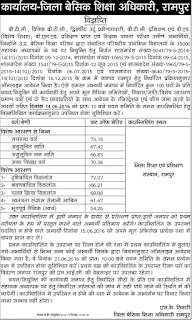 UP Districts NIC websites list is provided below where all districts Asst. 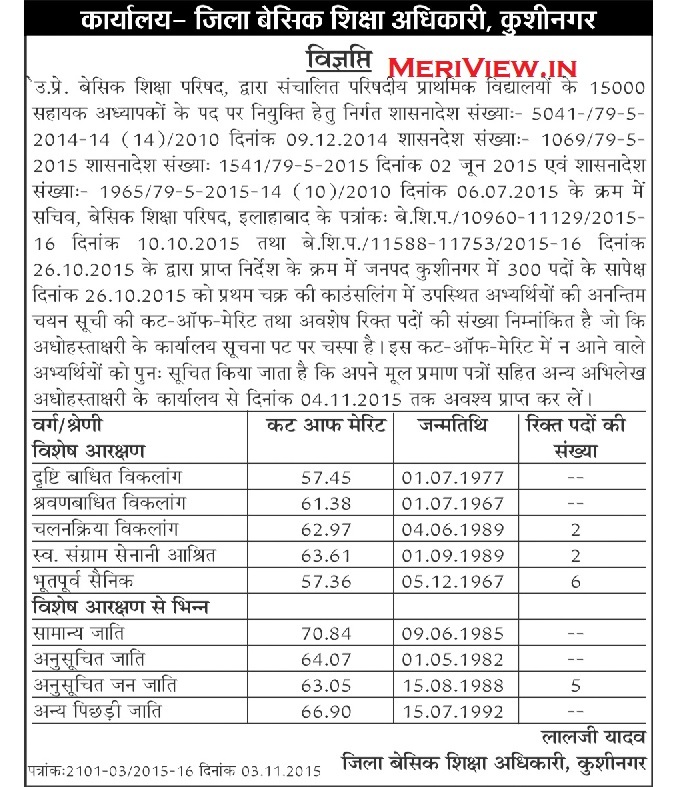 Teacher merit can be checked. 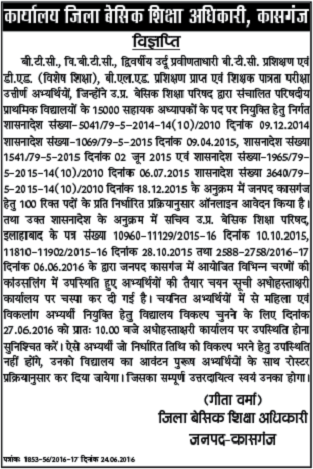 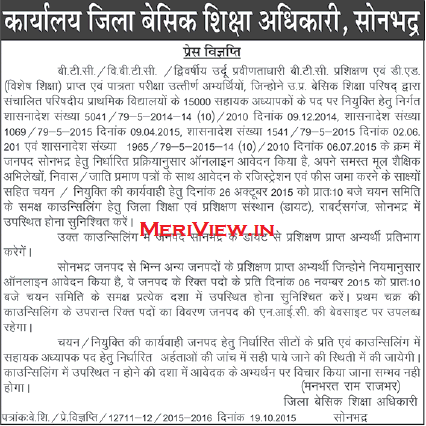 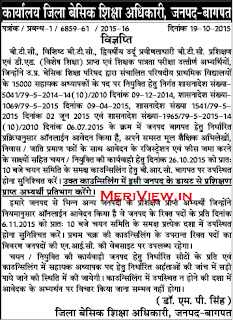 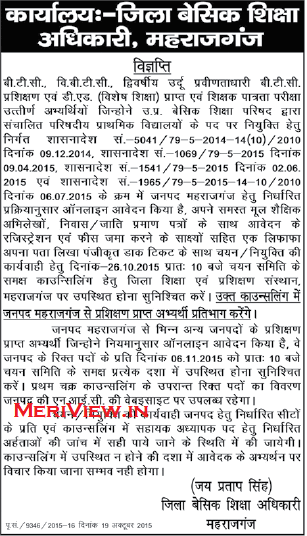 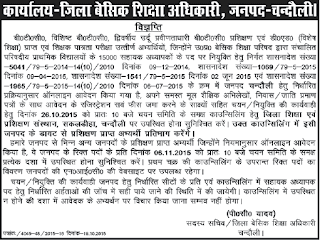 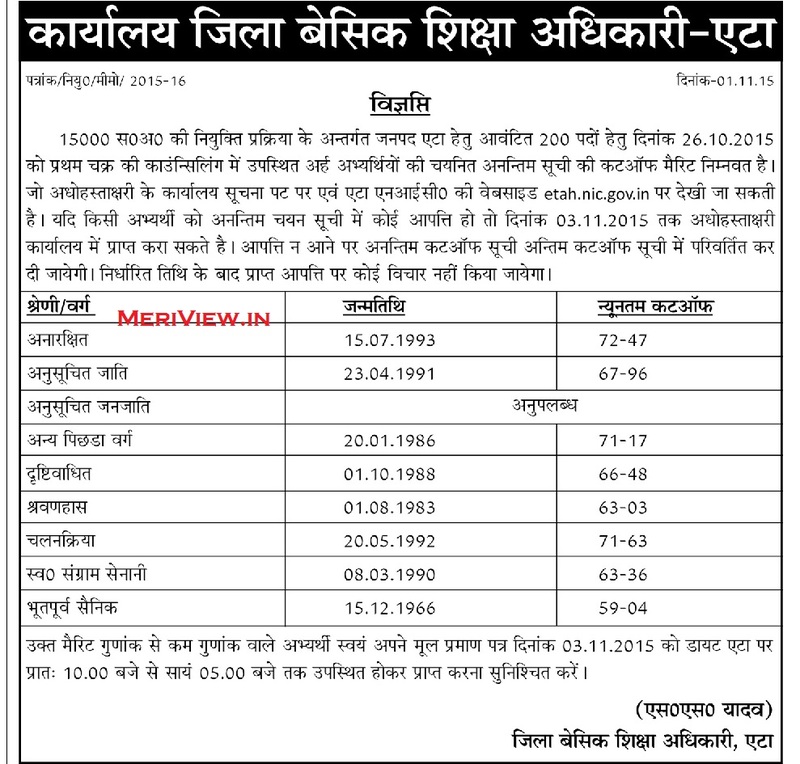 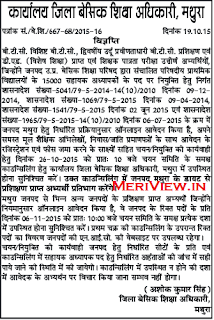 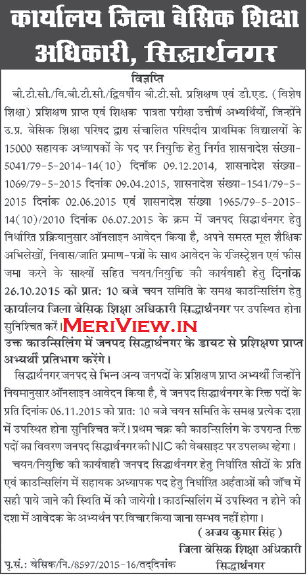 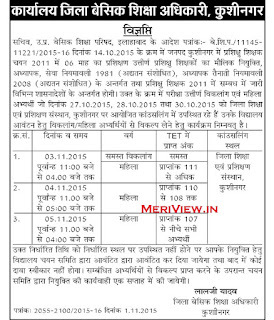 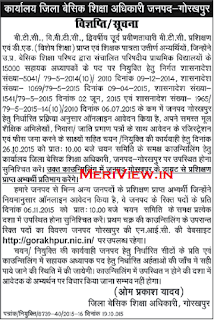 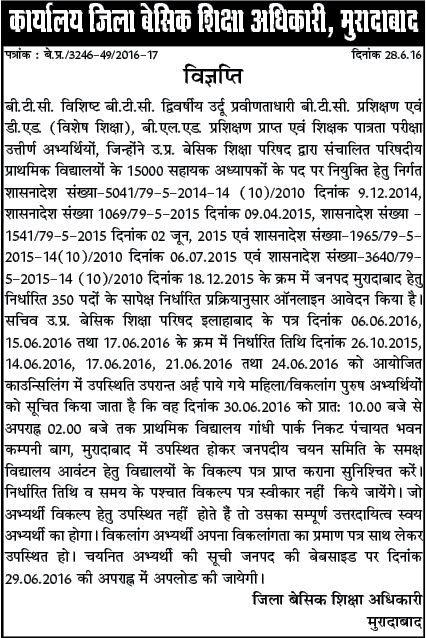 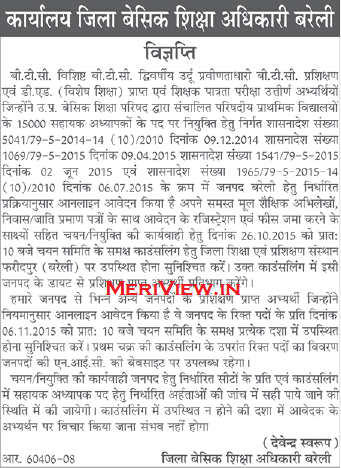 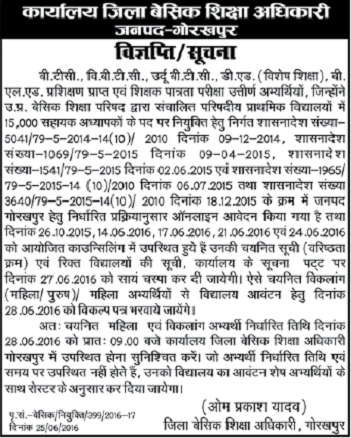 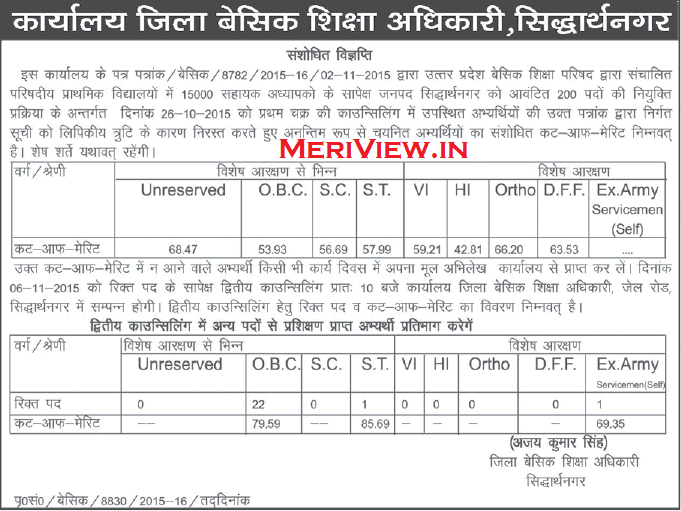 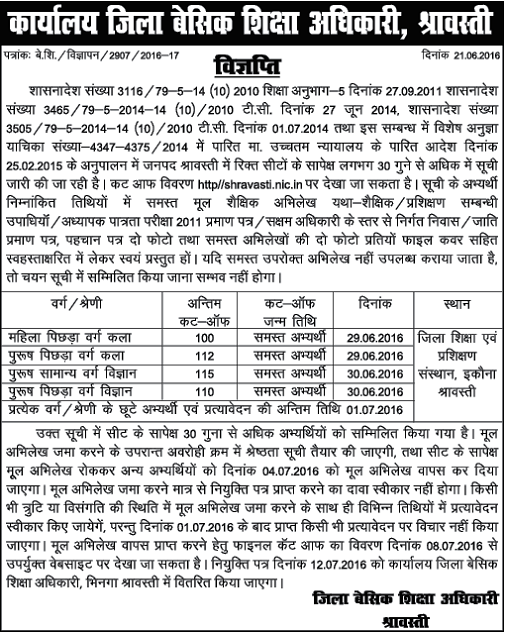 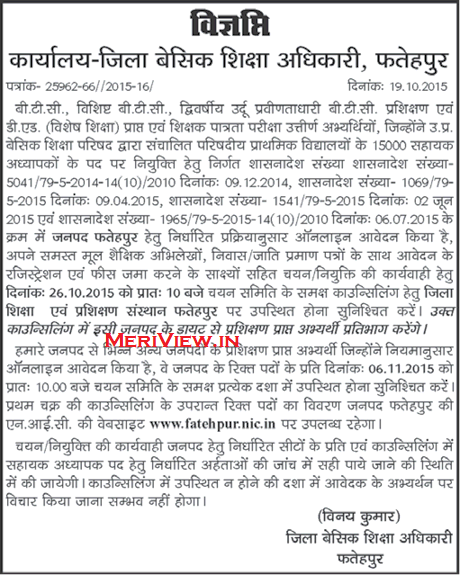 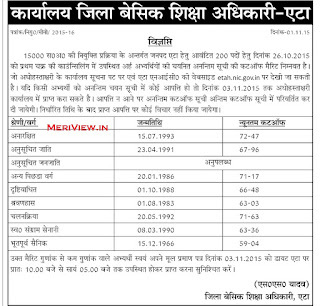 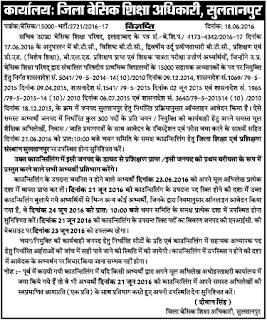 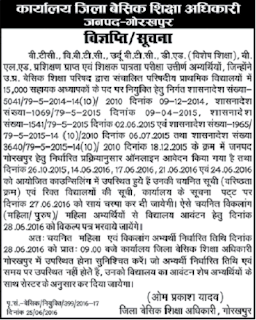 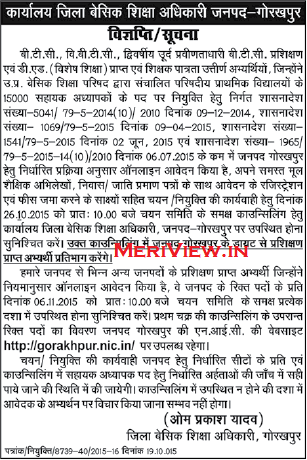 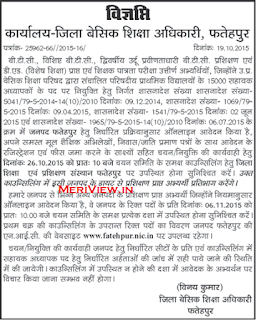 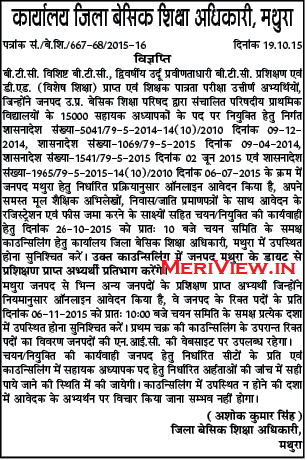 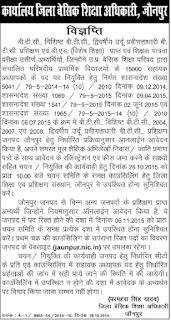 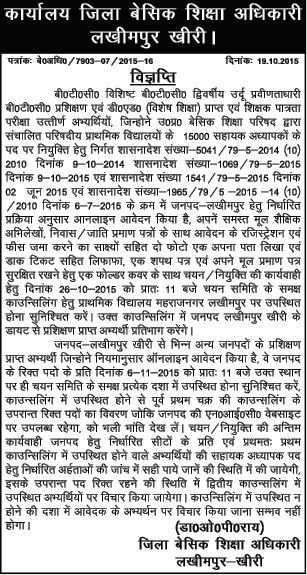 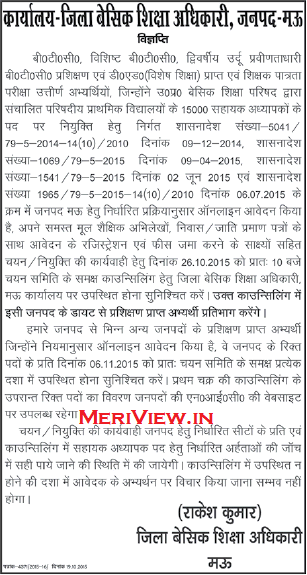 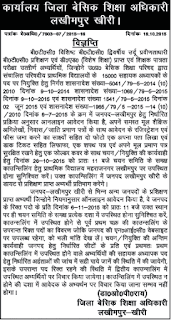 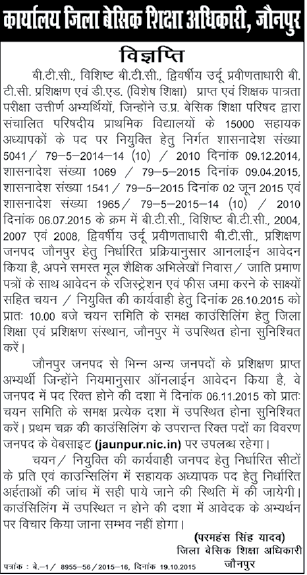 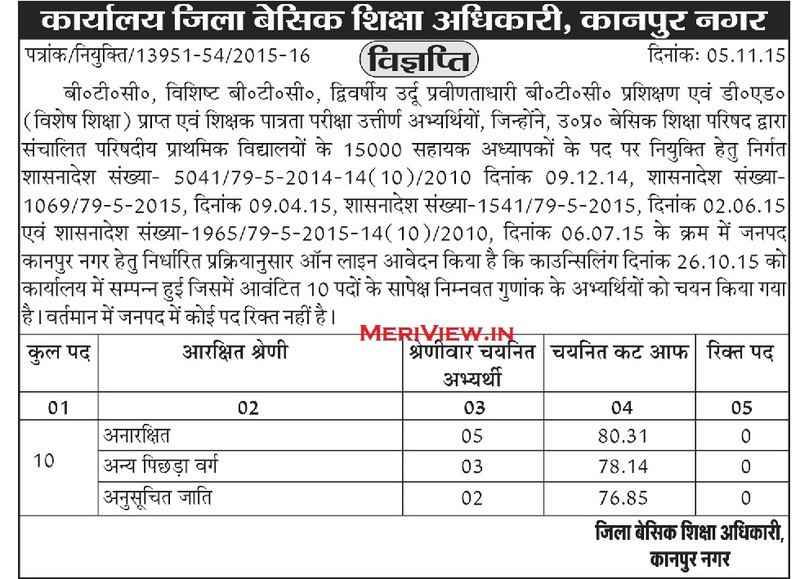 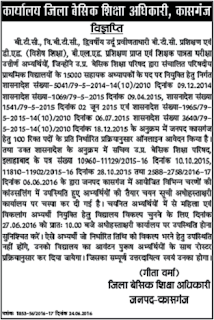 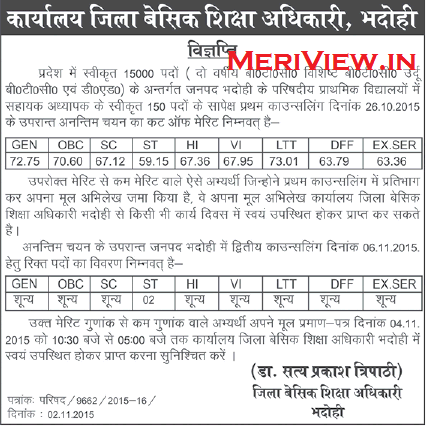 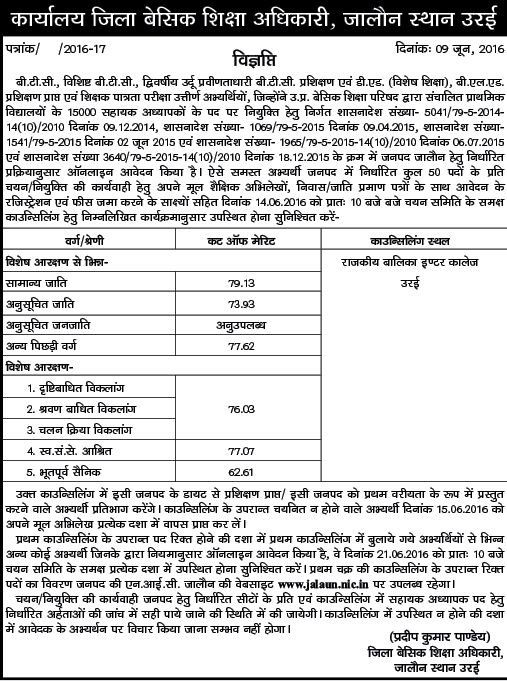 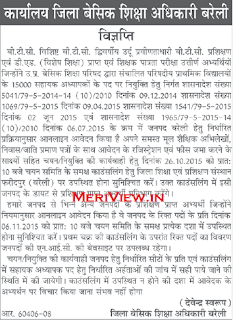 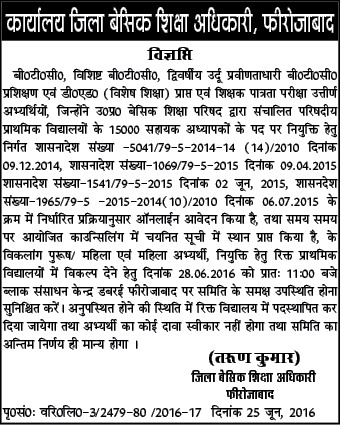 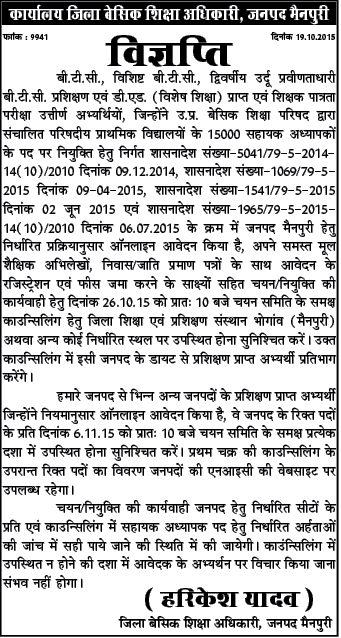 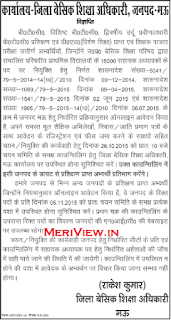 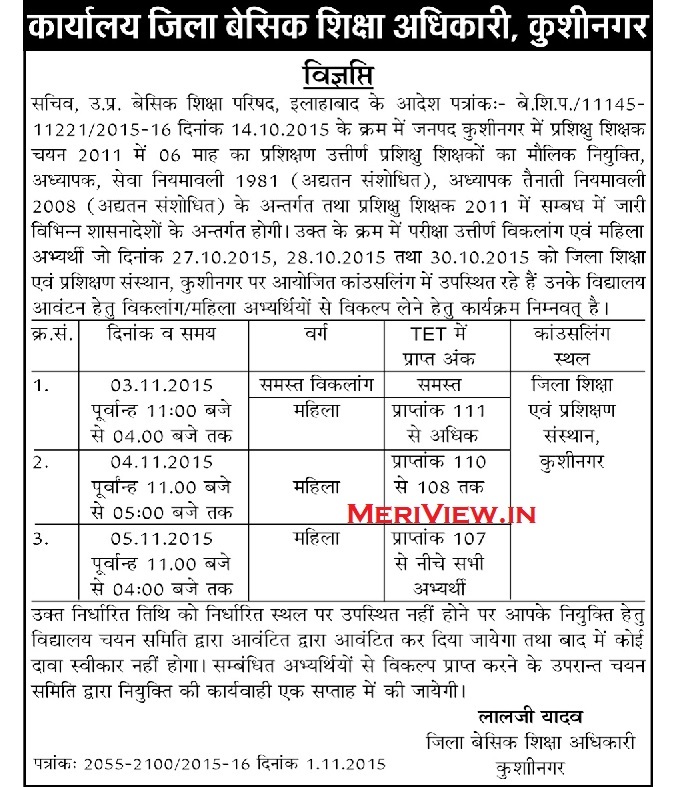 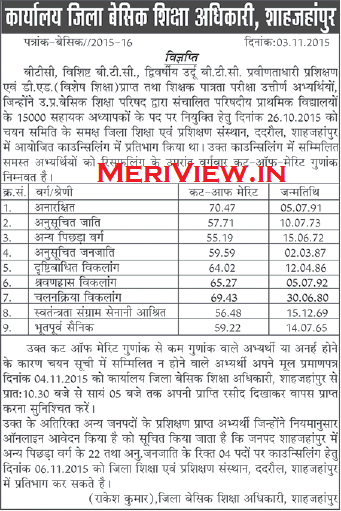 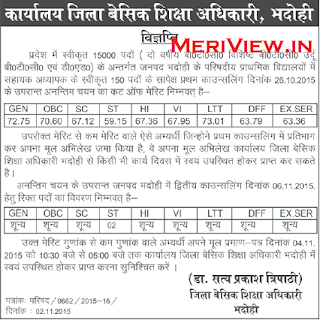 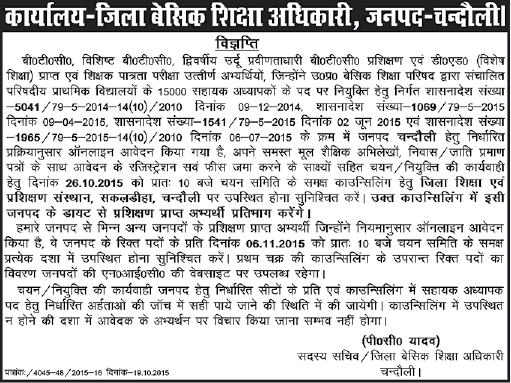 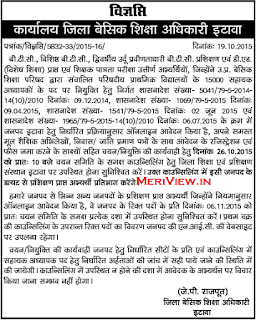 BTC 15000 Teacher Counselling date 2015 - Selection procedure: Counselling date of candidates as per the criteria given below will be prepared. 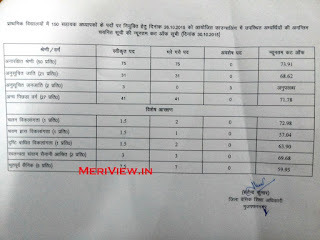 Based on that, candidates would be selected through counselling to be conducted district-wise.